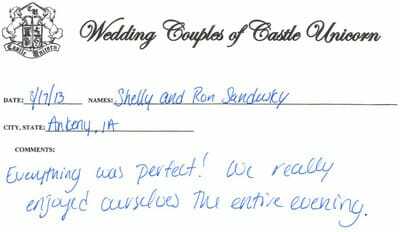 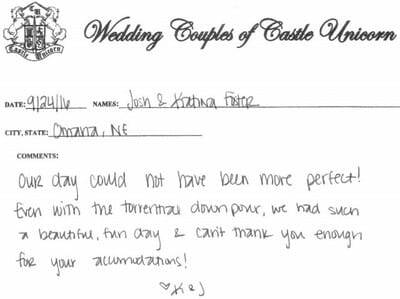 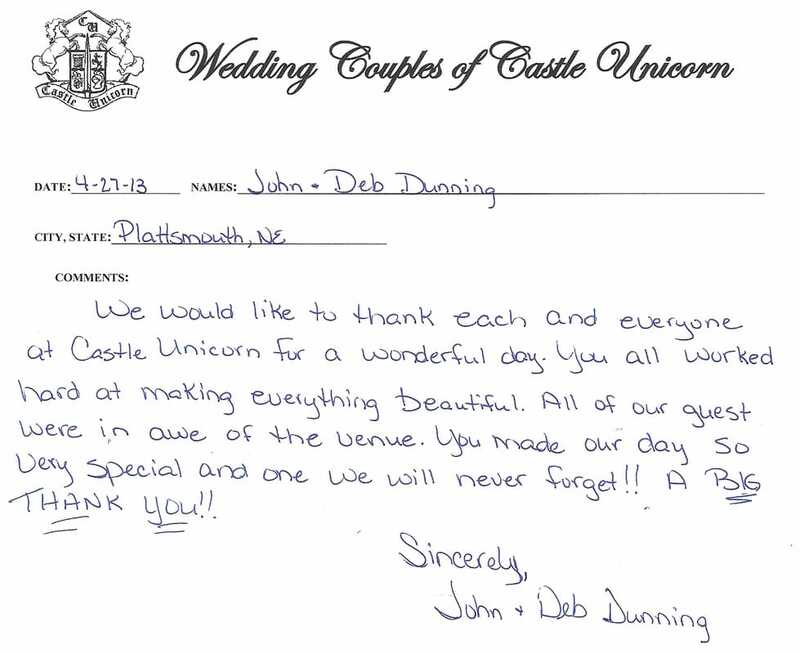 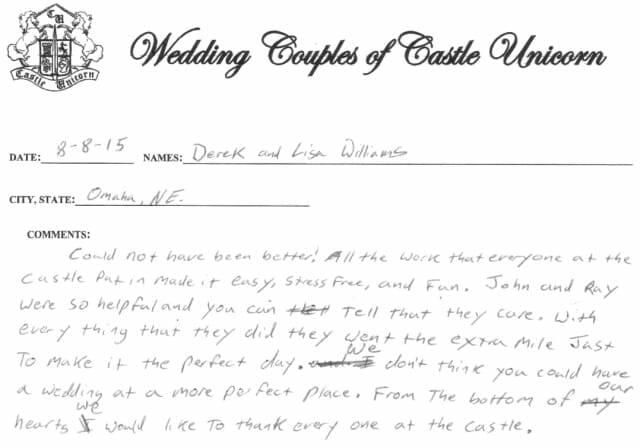 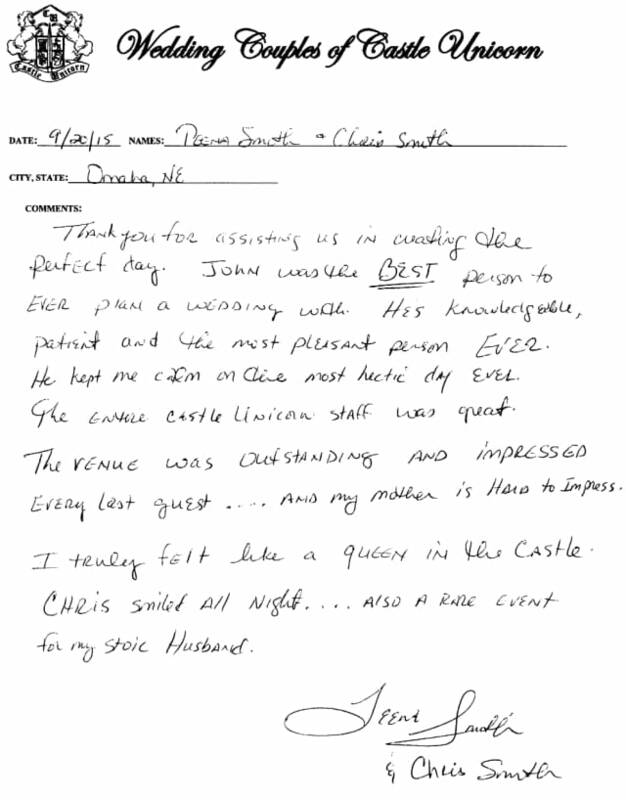 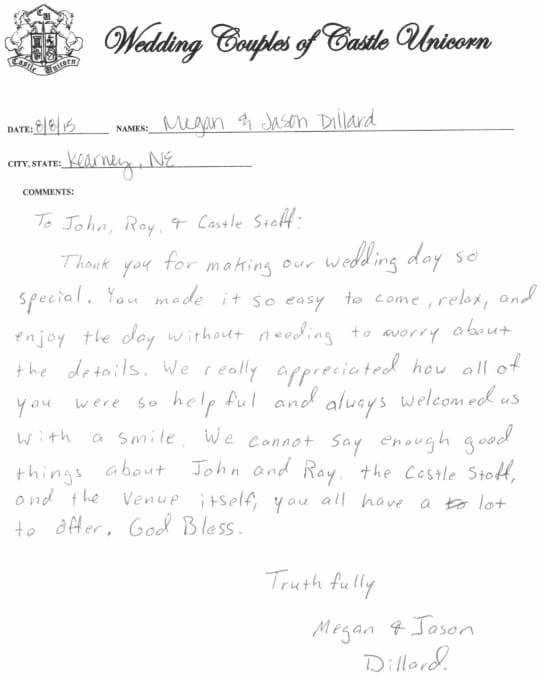 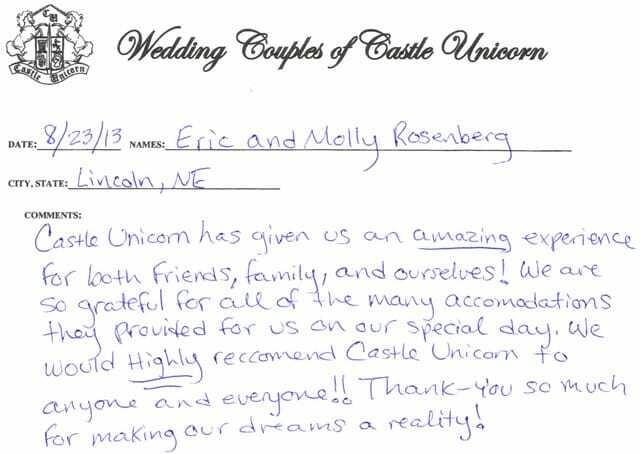 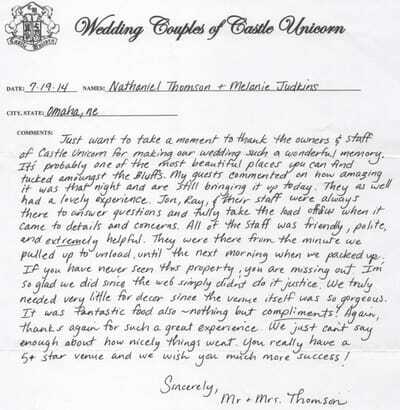 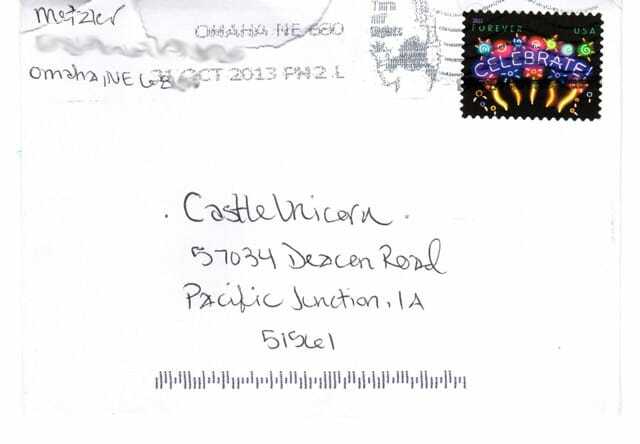 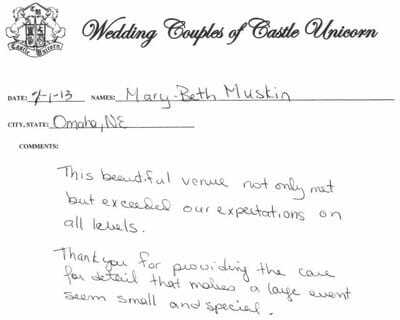 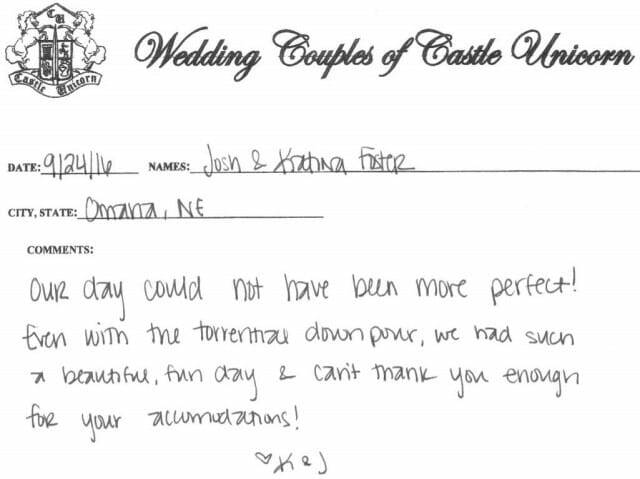 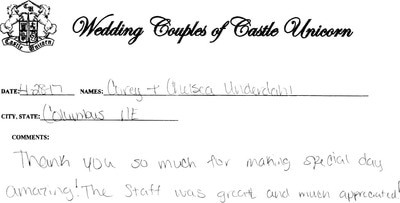 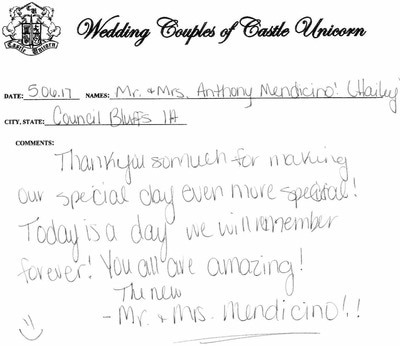 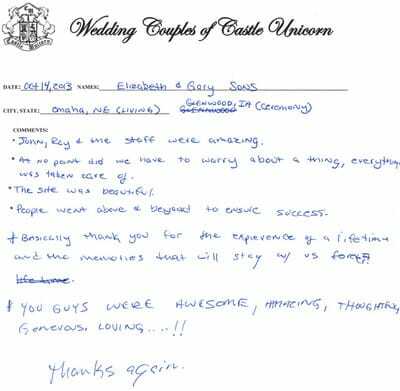 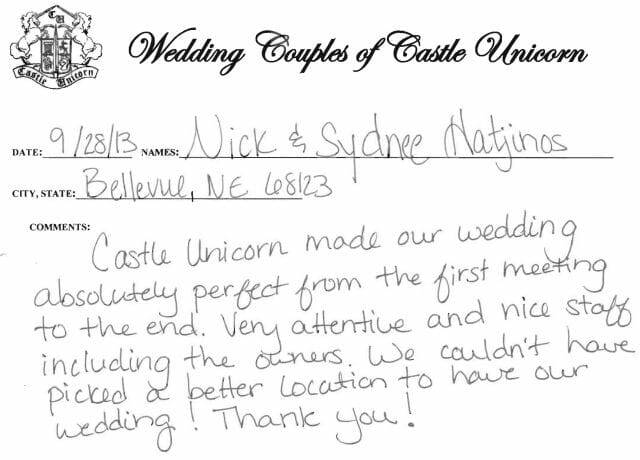 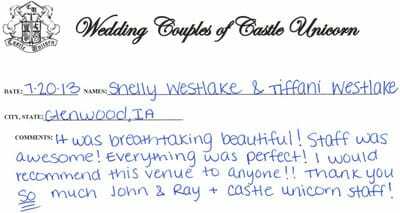 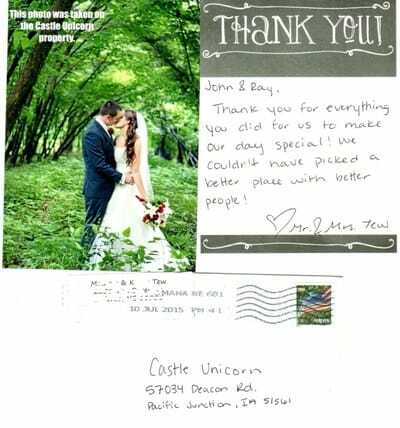 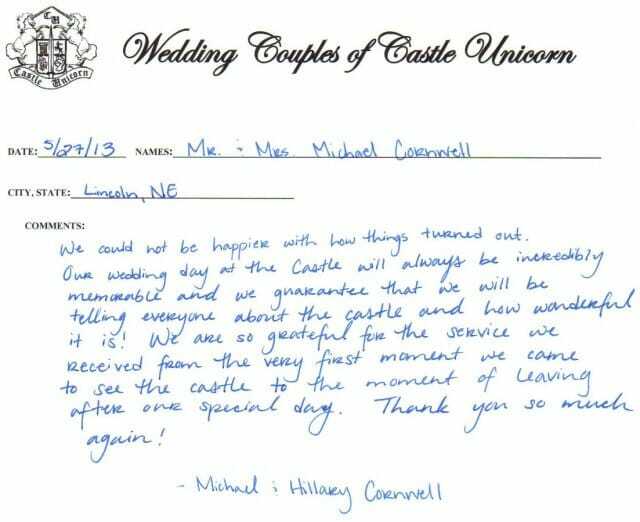 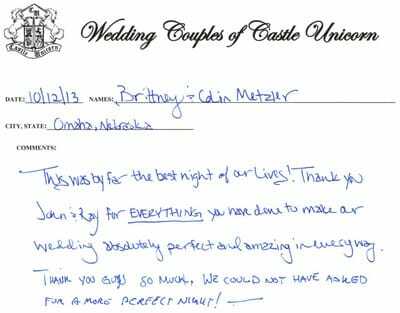 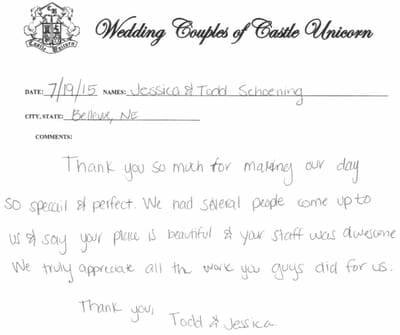 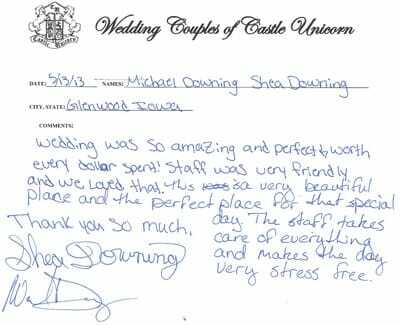 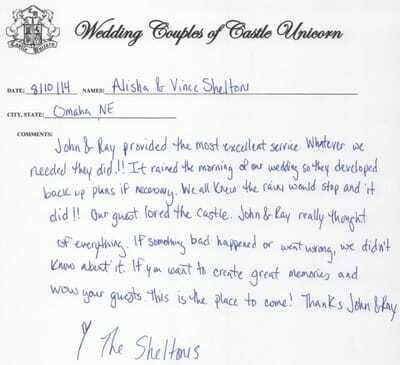 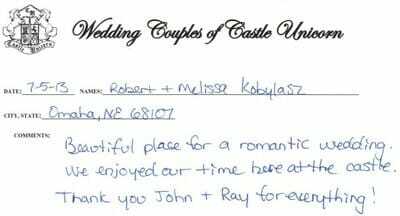 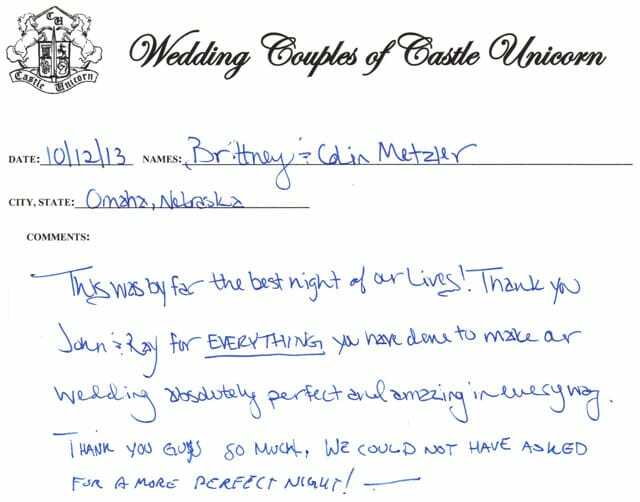 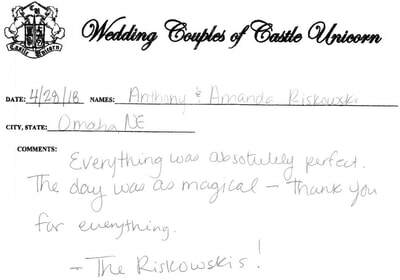 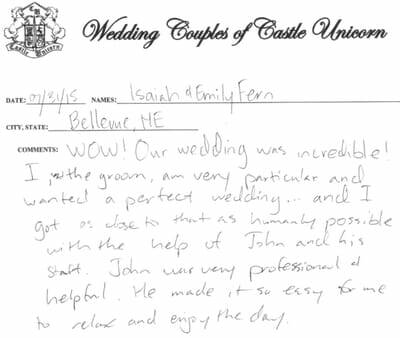 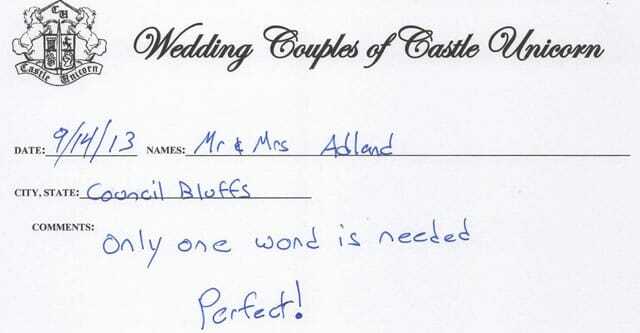 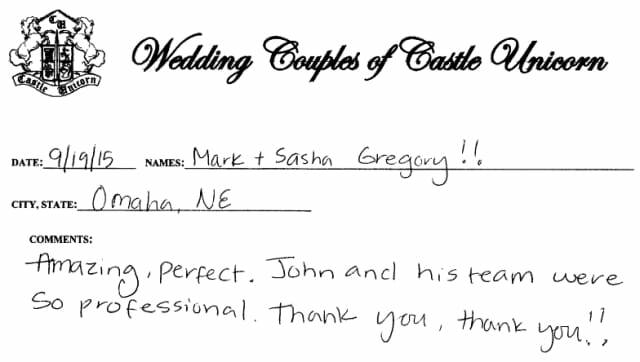 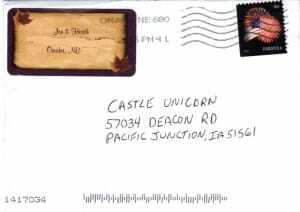 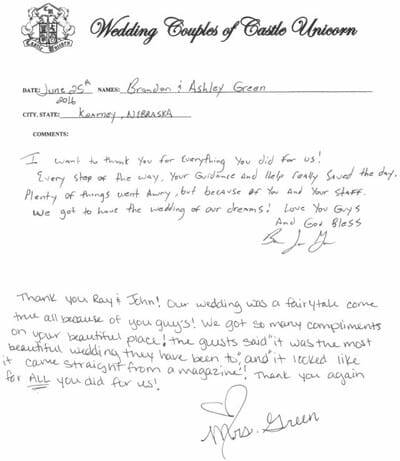 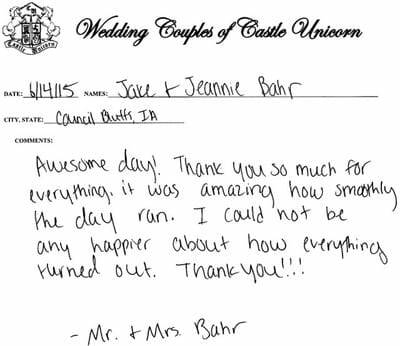 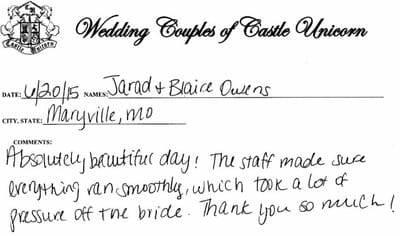 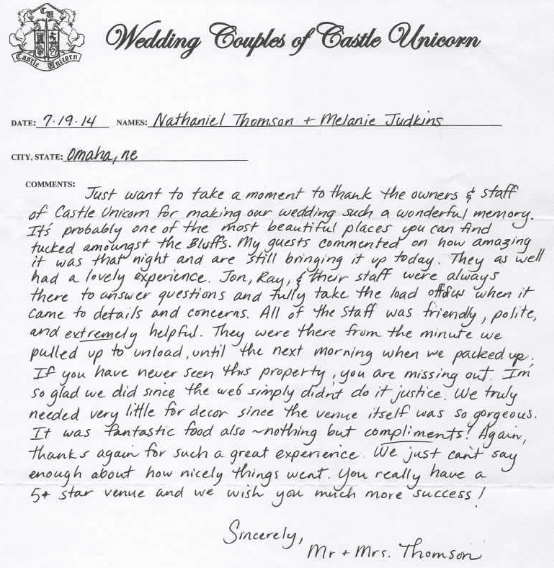 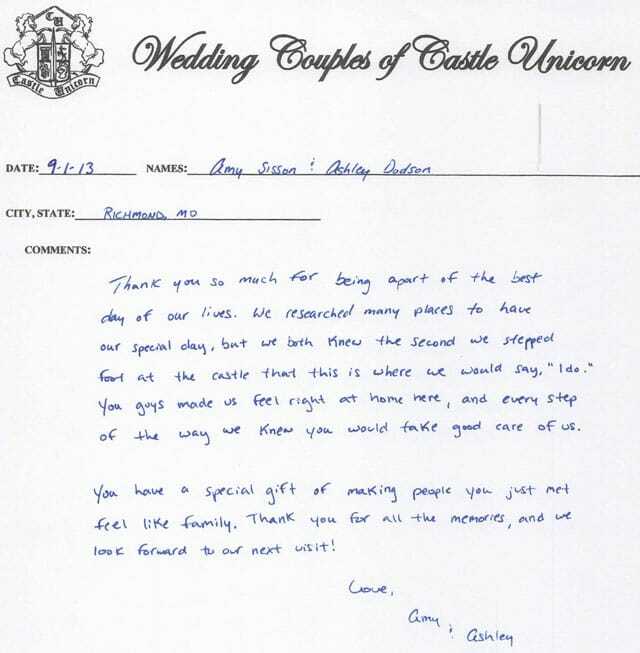 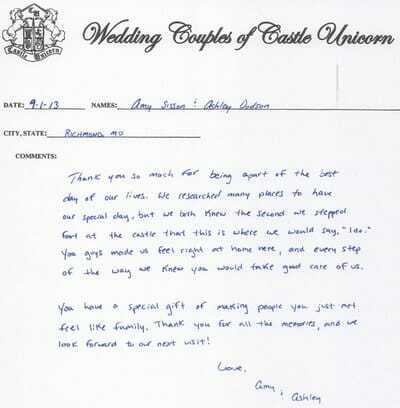 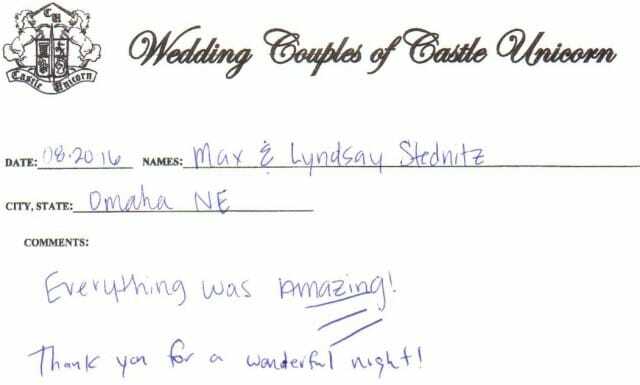 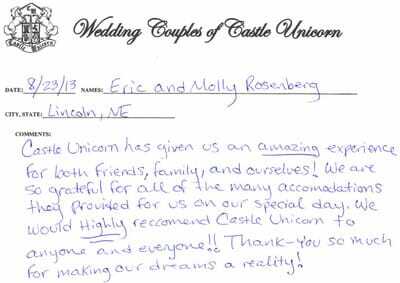 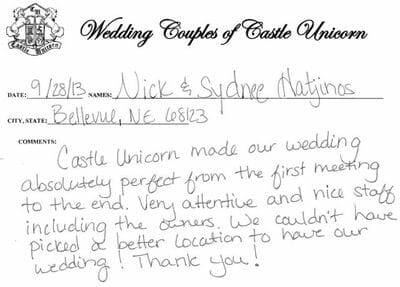 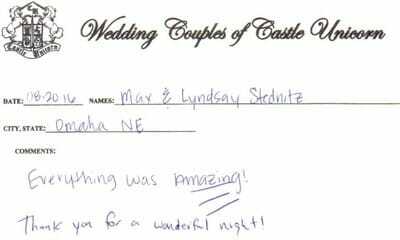 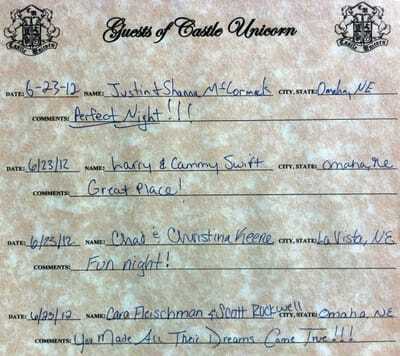 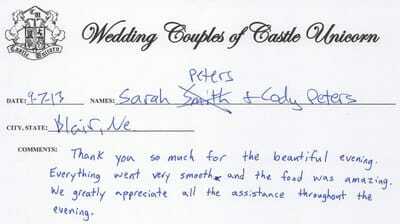 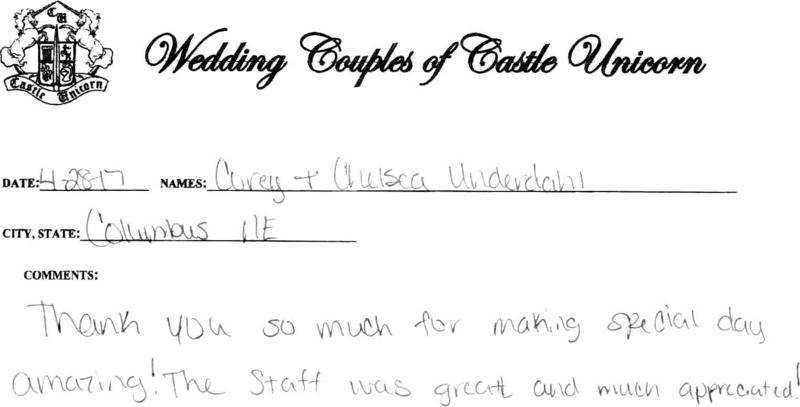 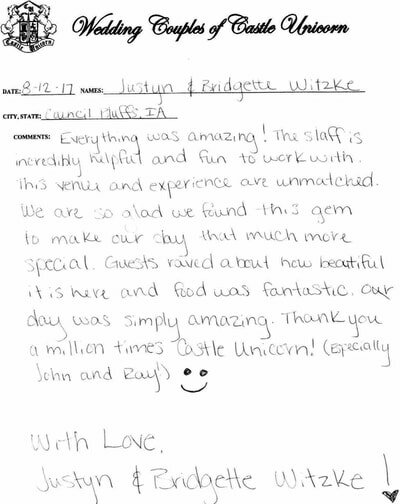 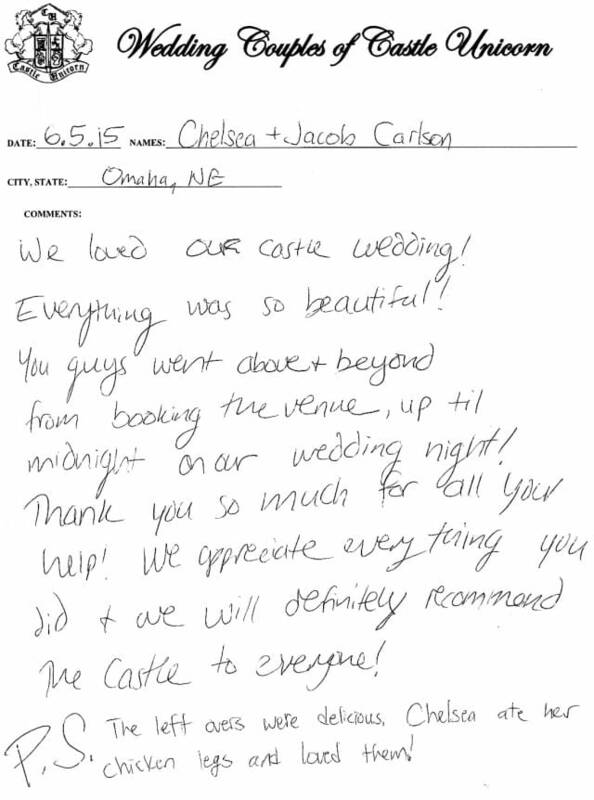 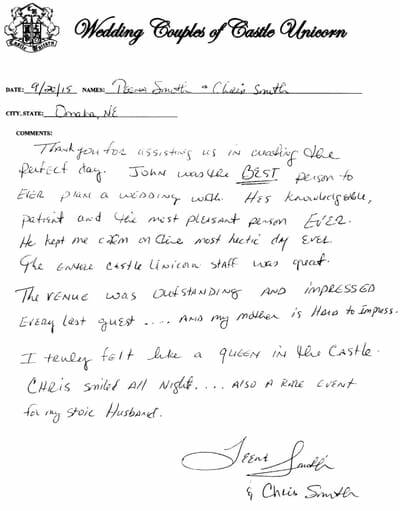 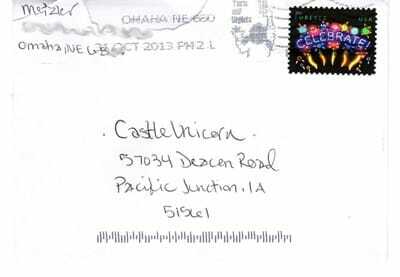 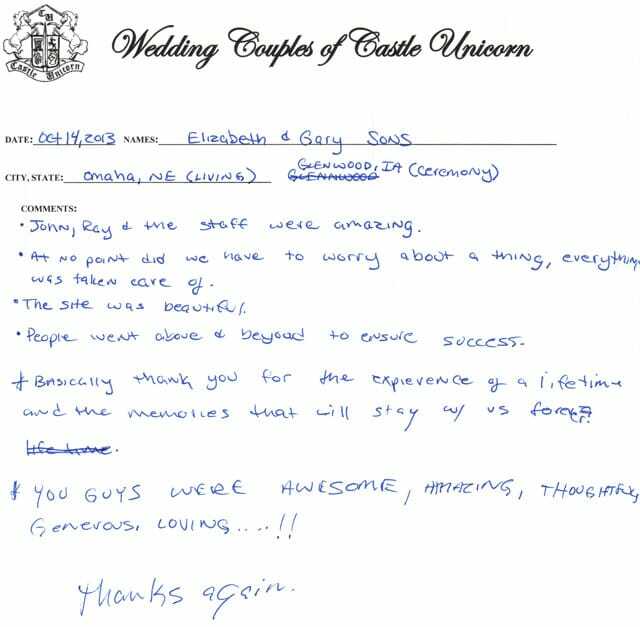 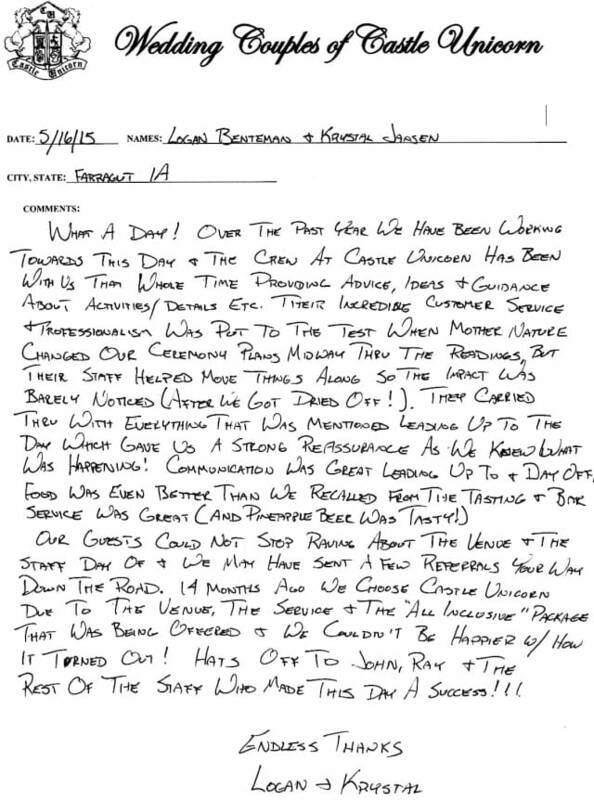 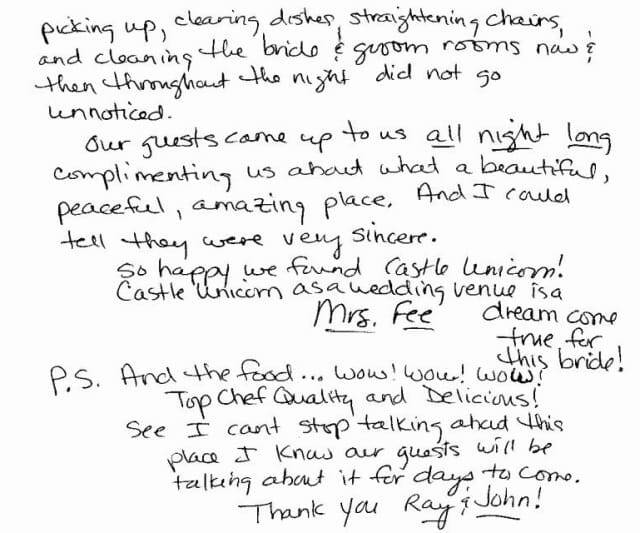 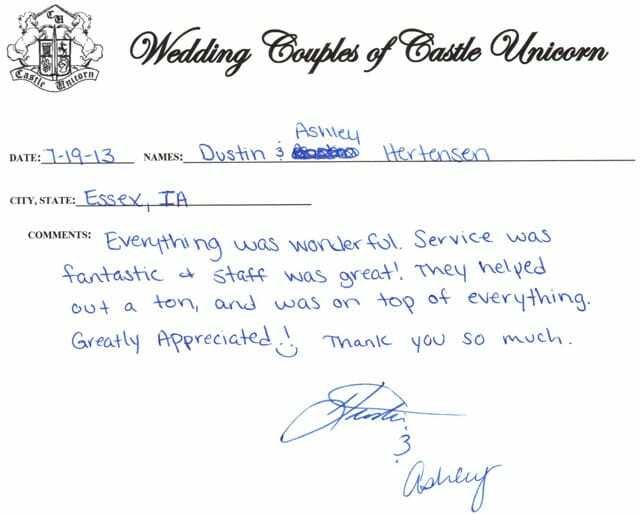 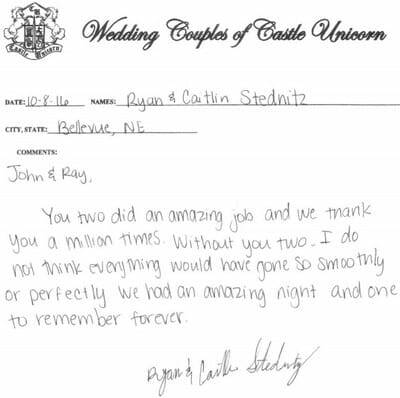 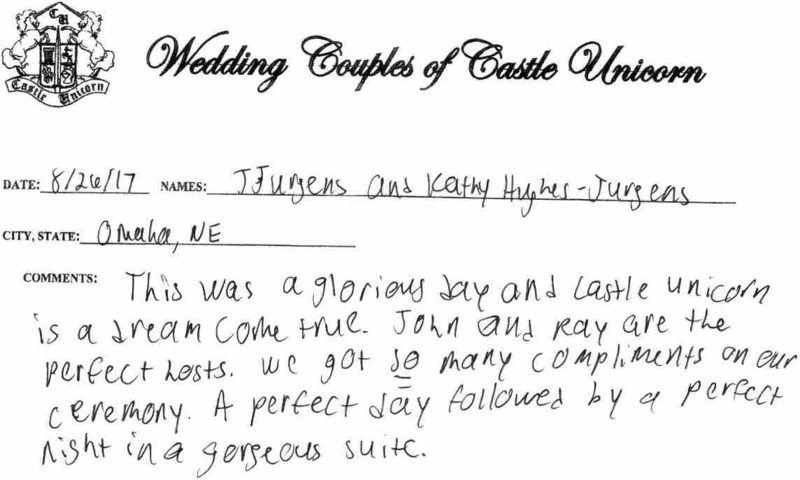 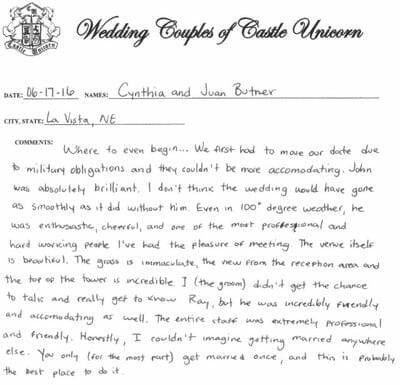 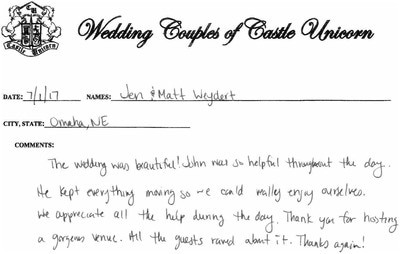 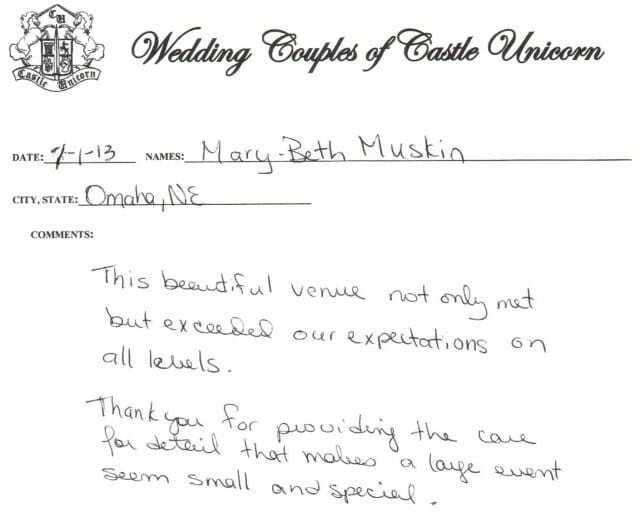 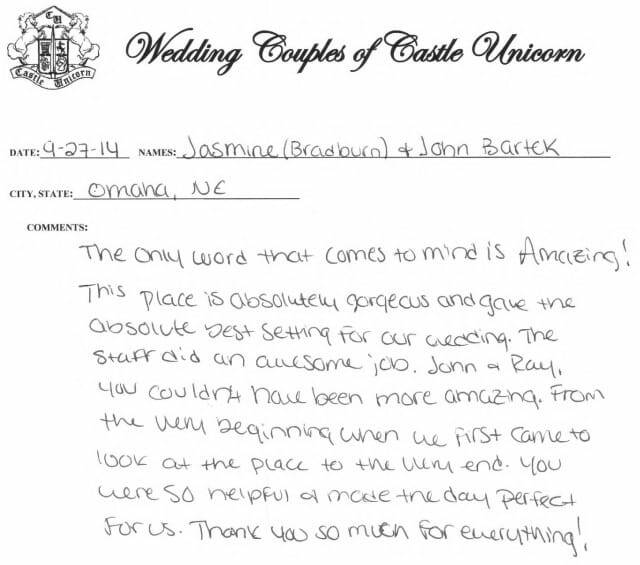 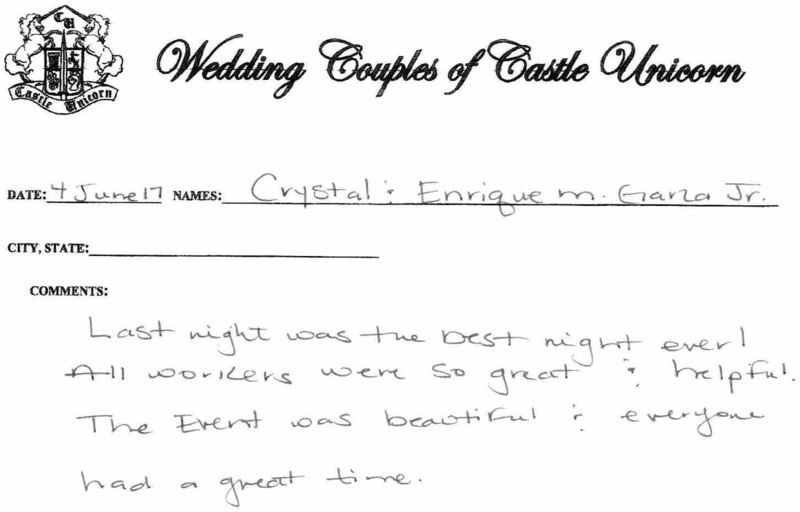 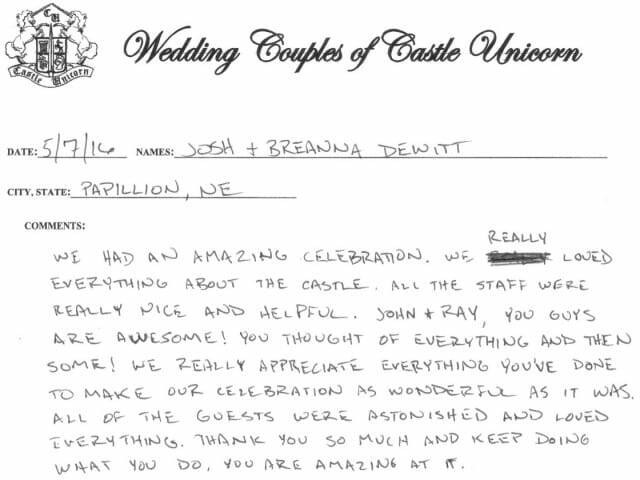 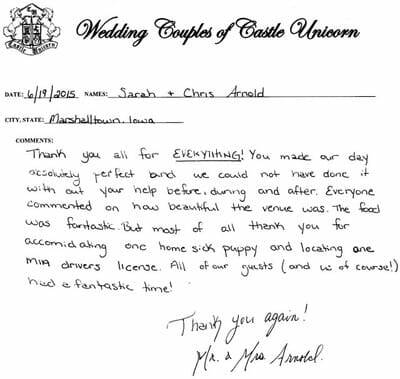 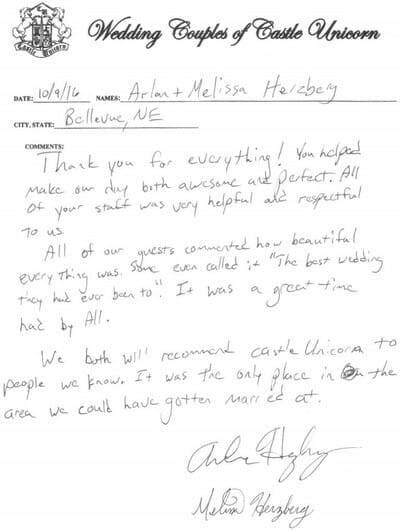 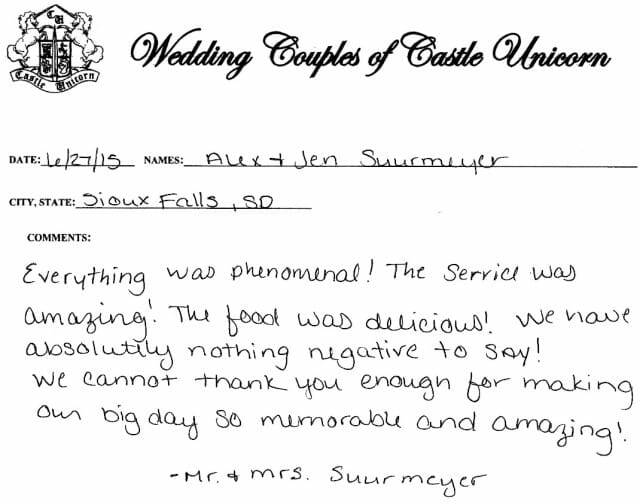 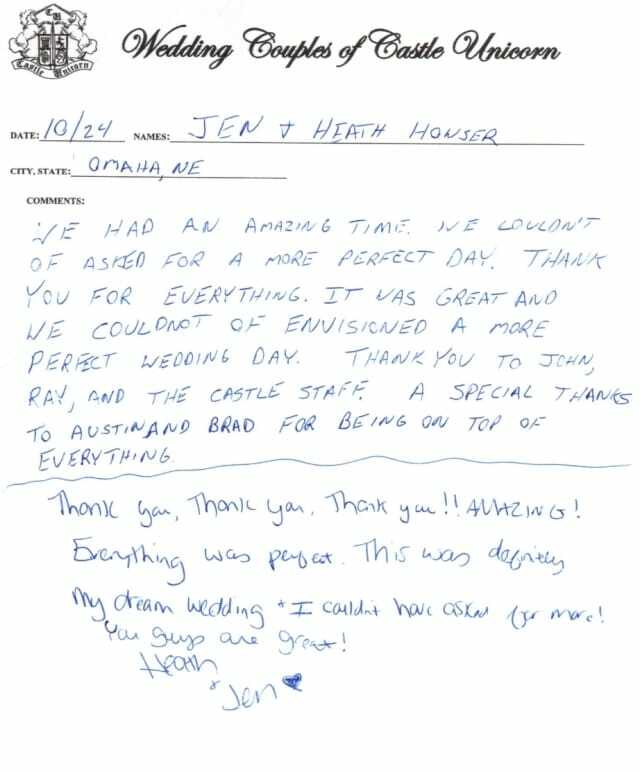 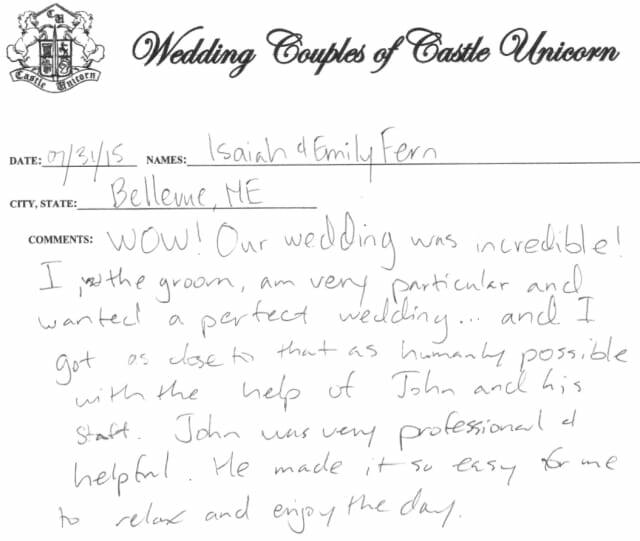 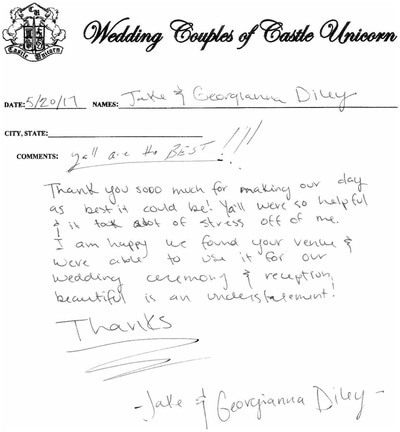 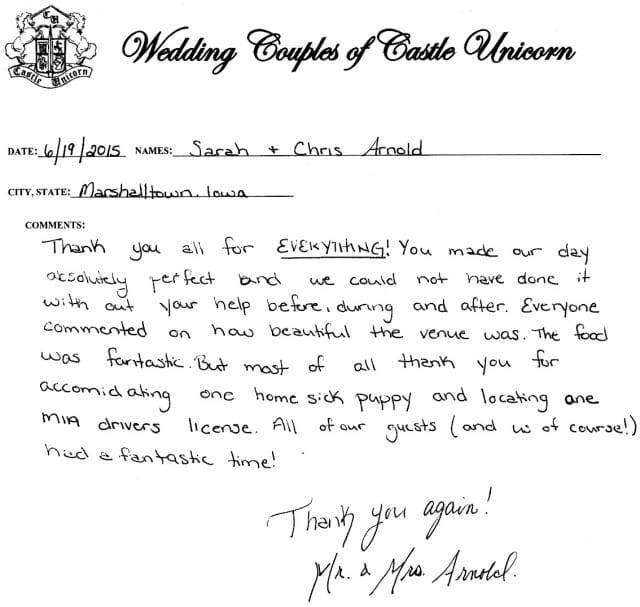 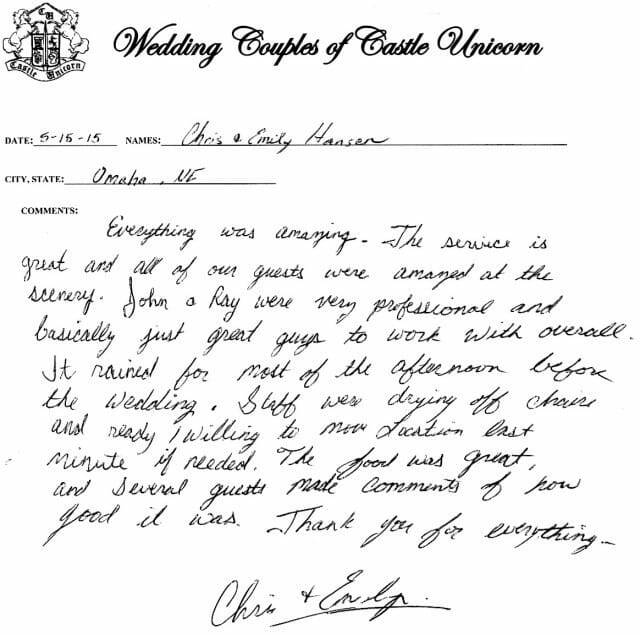 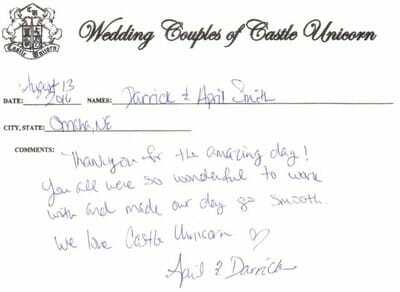 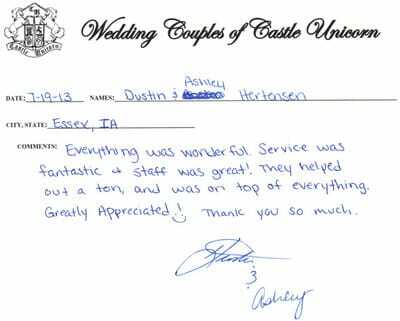 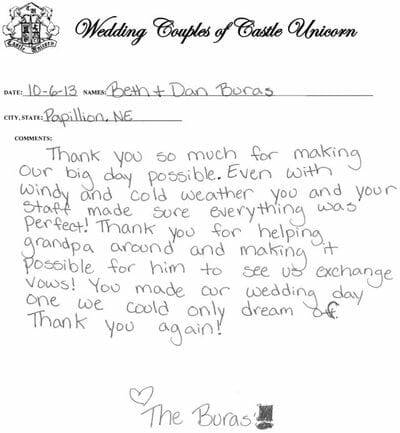 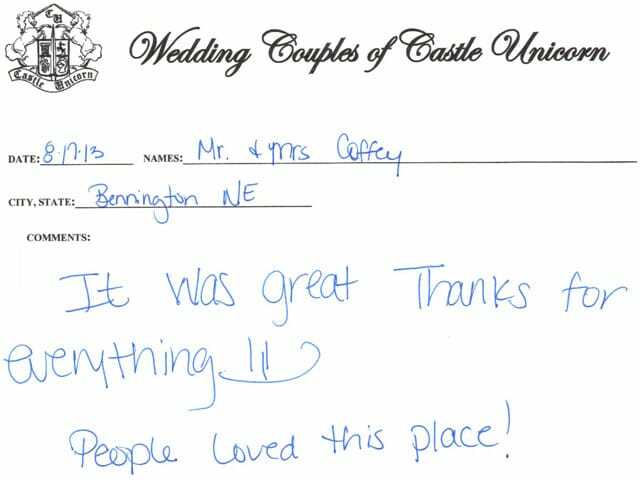 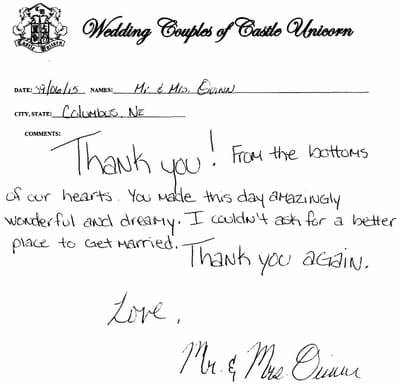 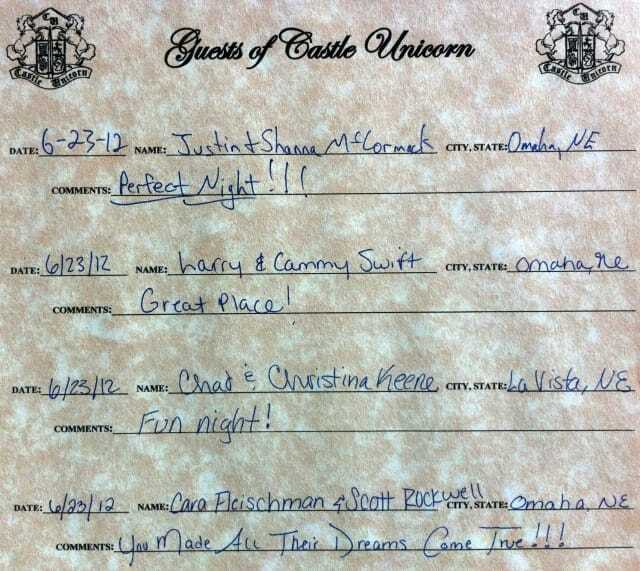 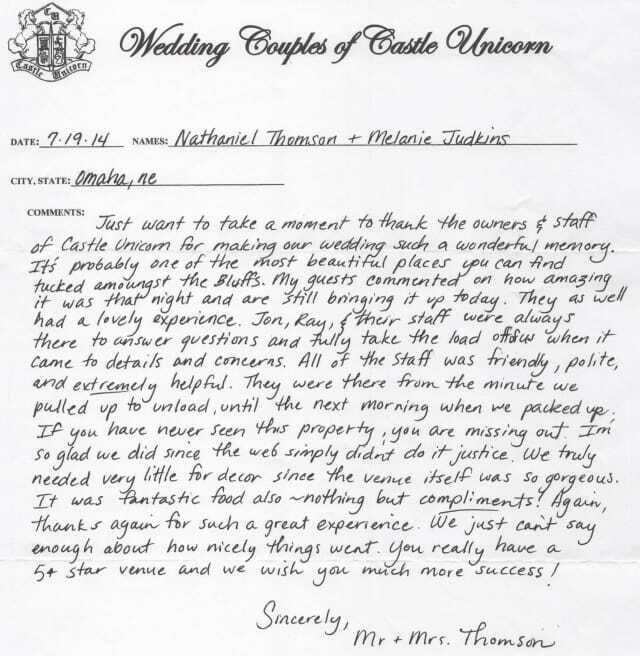 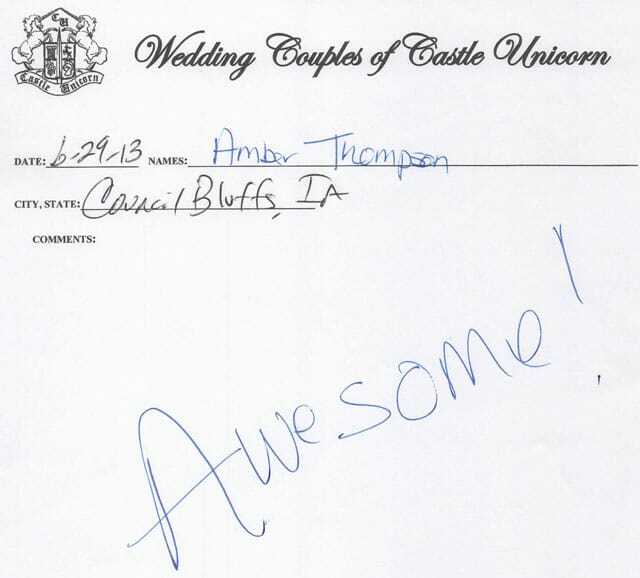 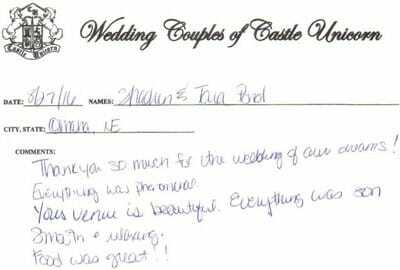 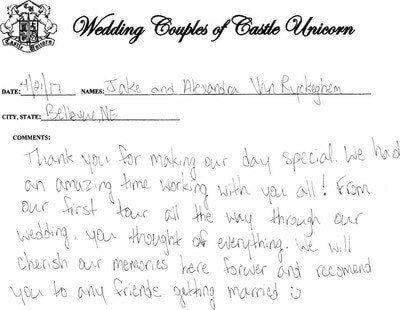 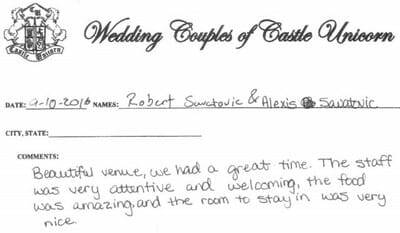 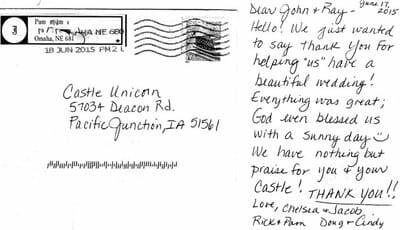 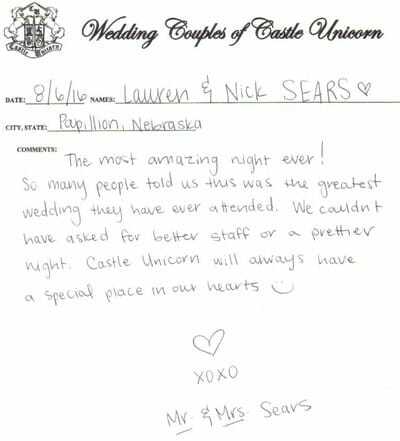 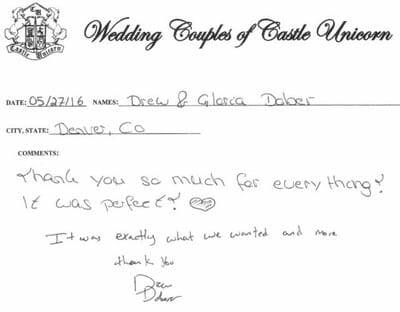 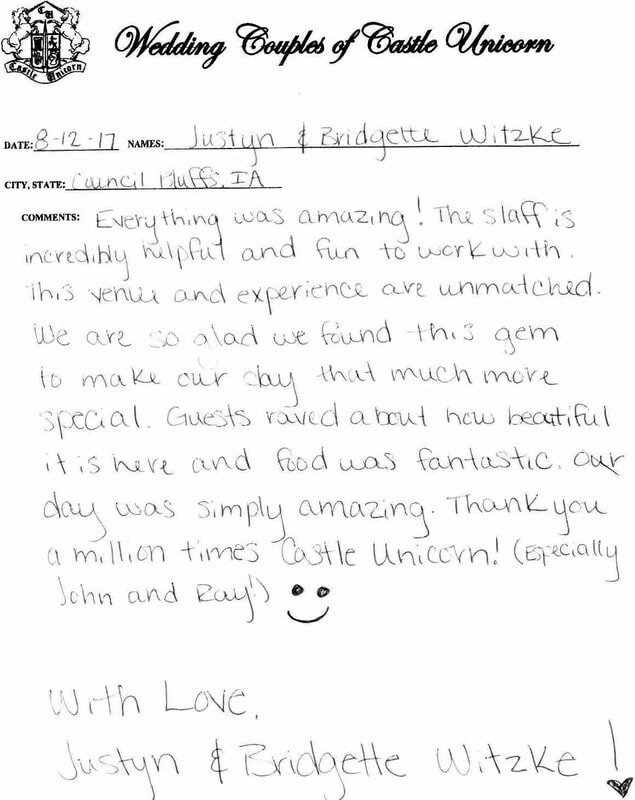 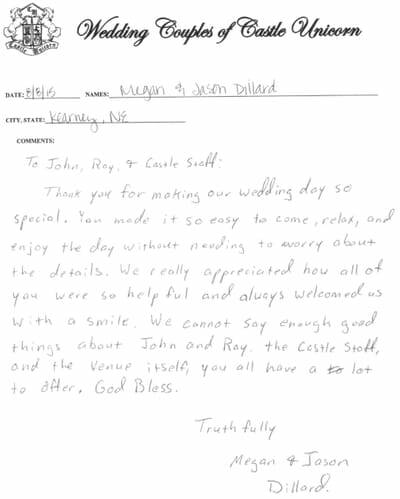 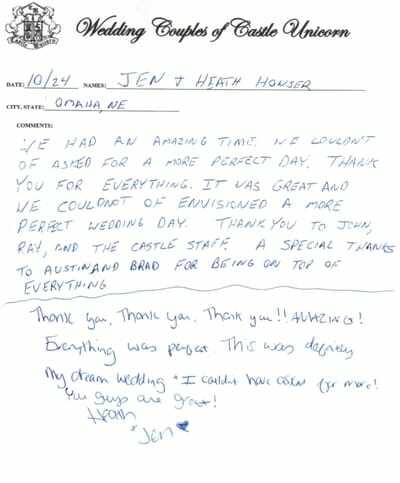 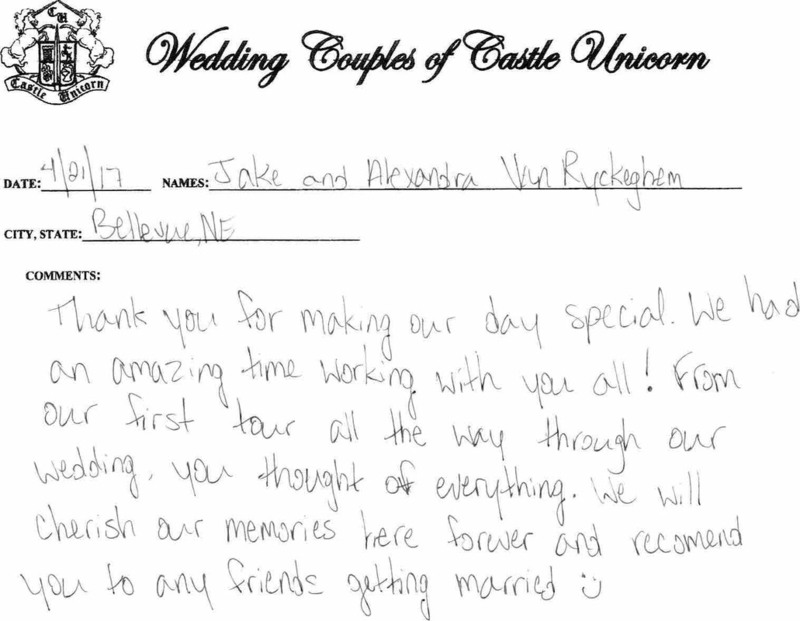 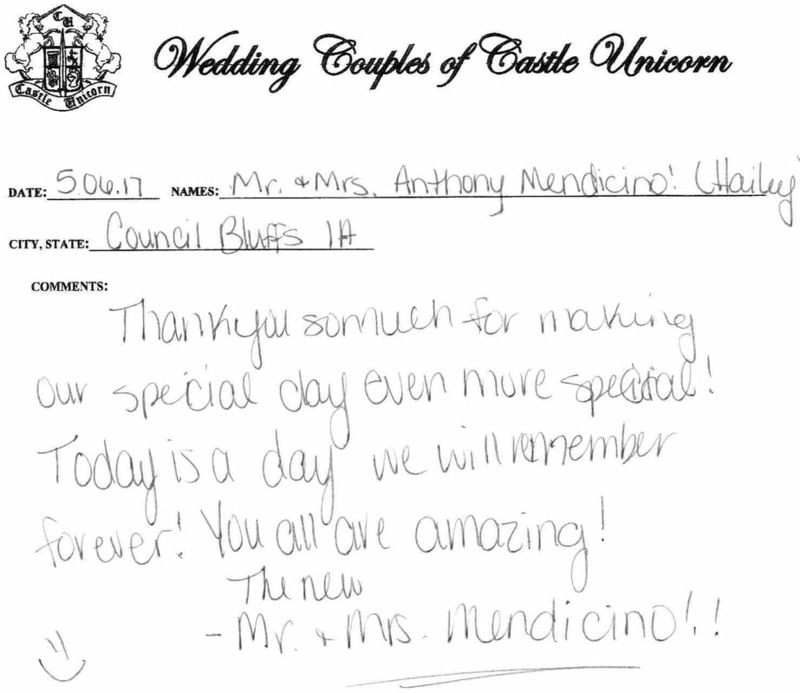 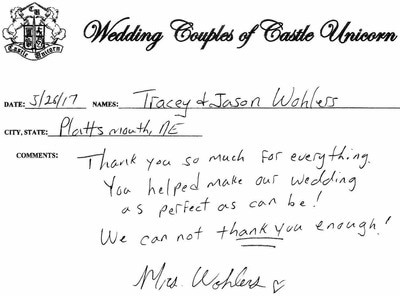 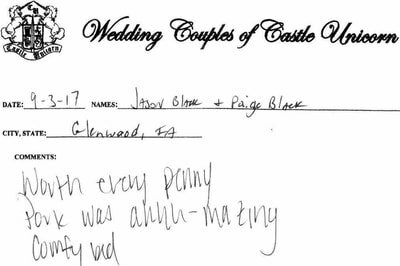 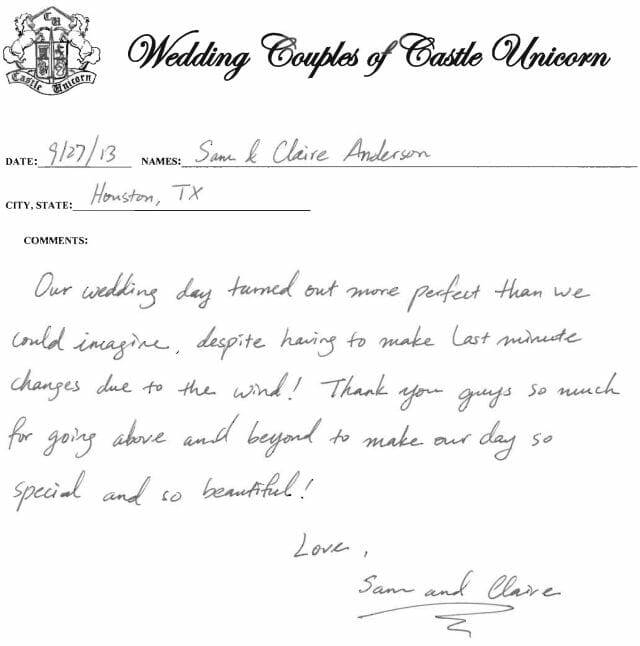 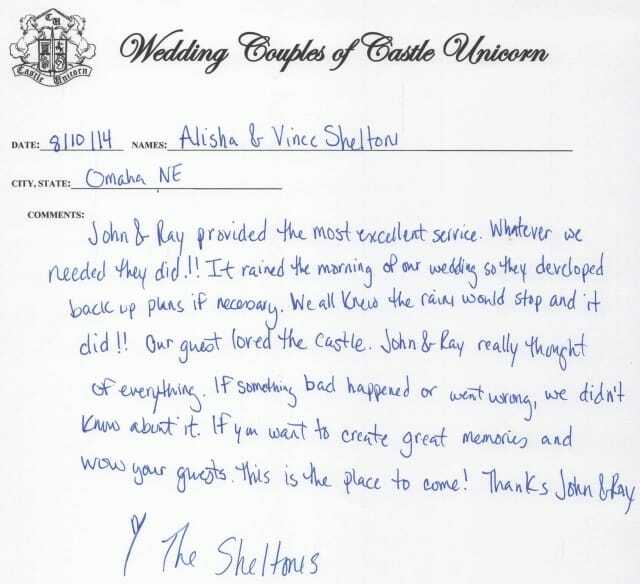 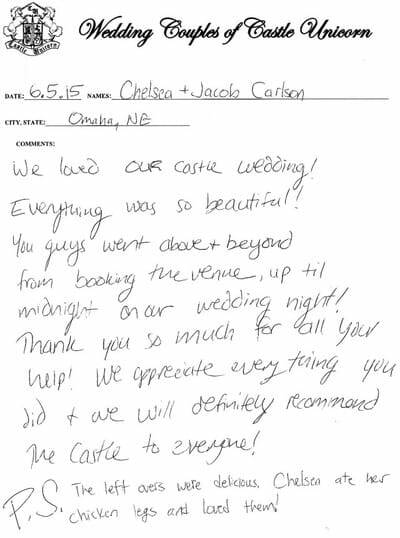 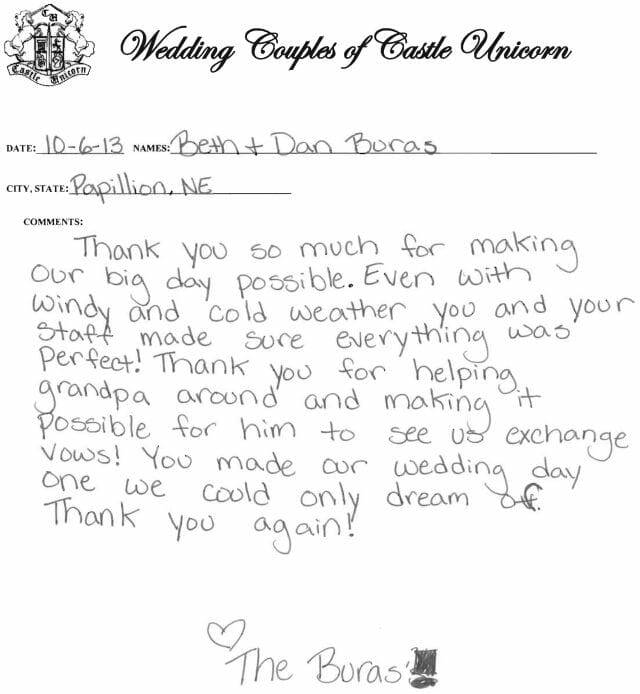 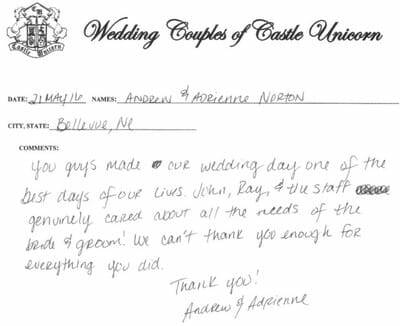 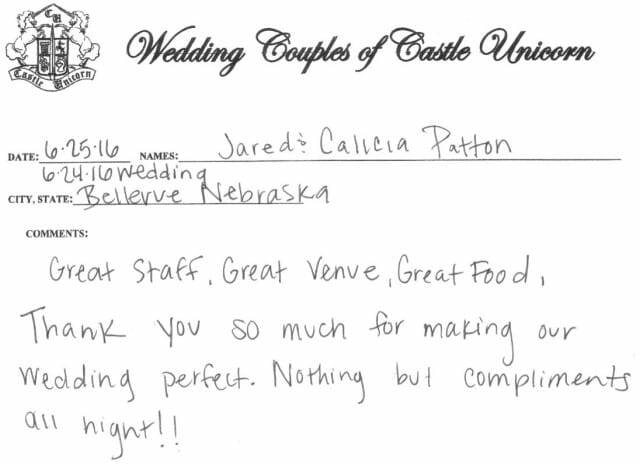 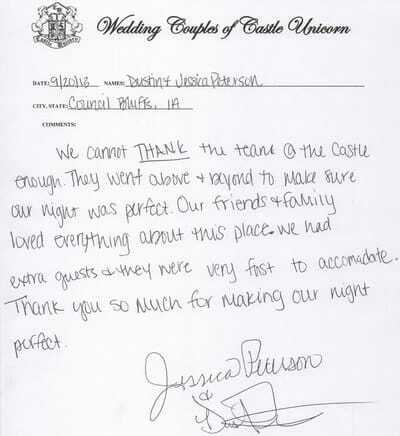 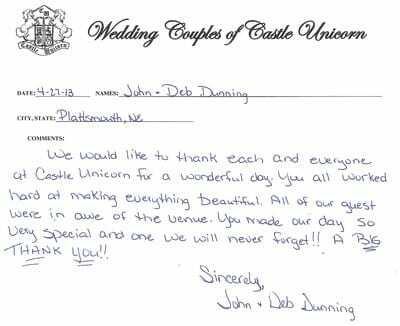 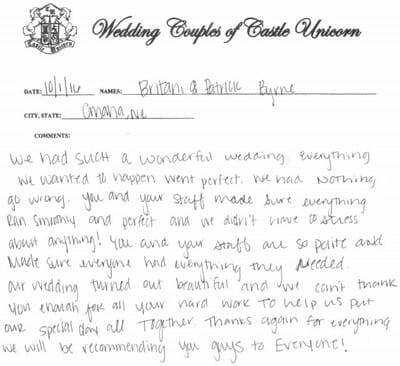 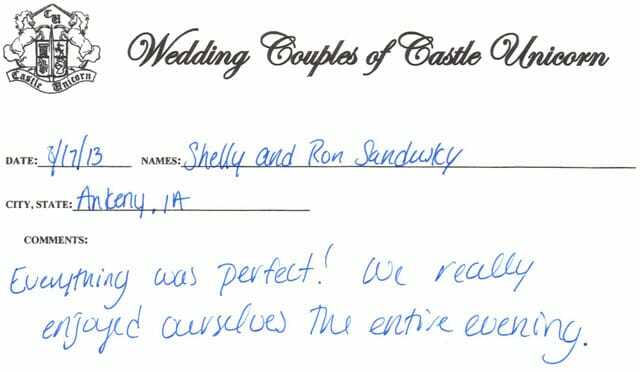 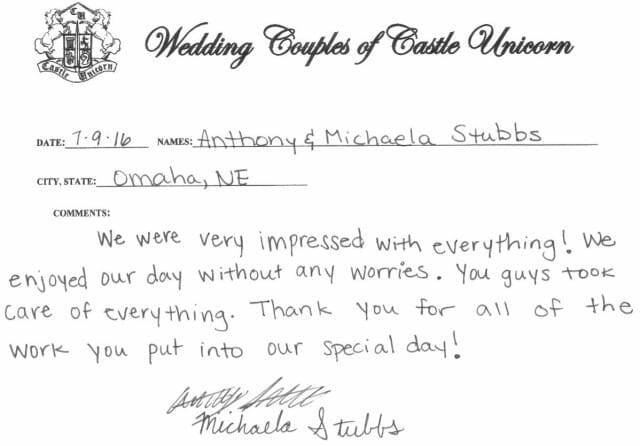 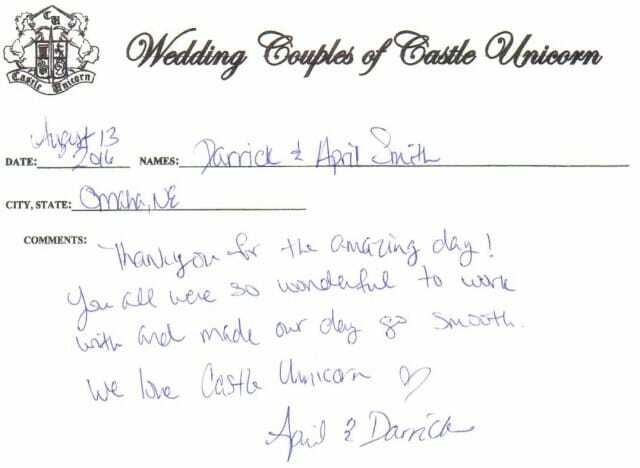 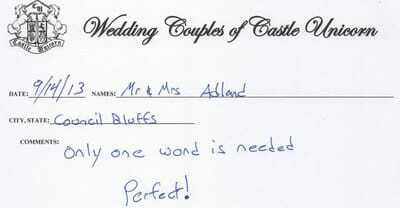 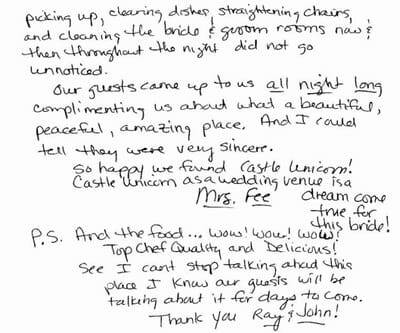 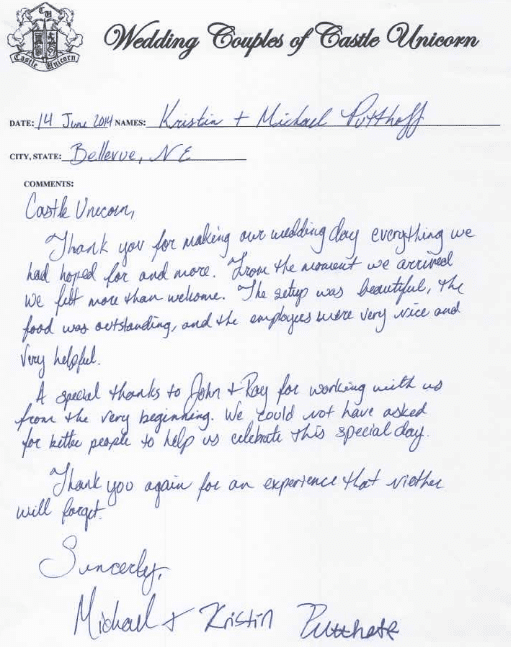 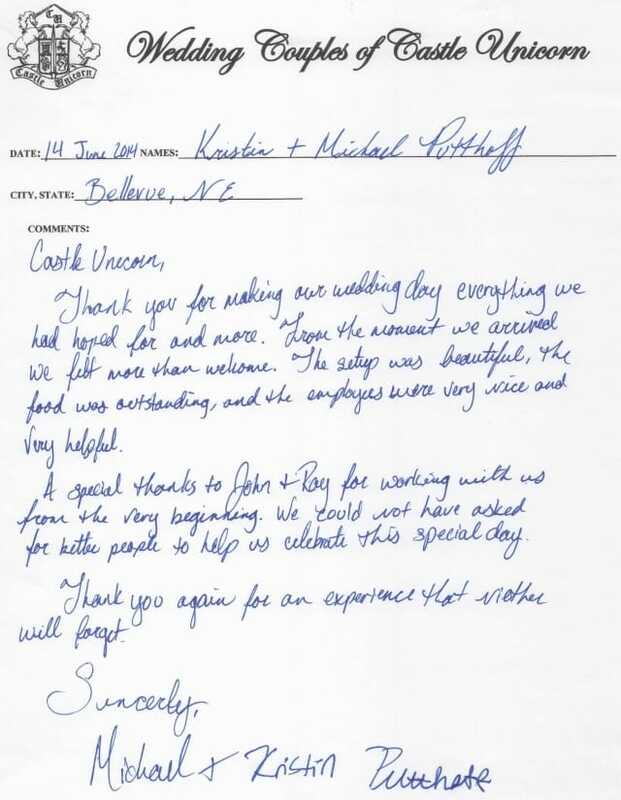 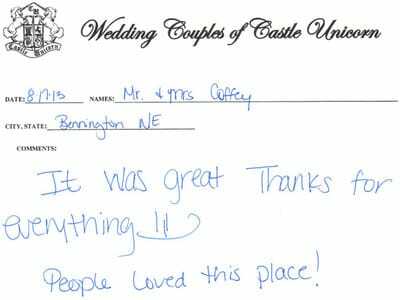 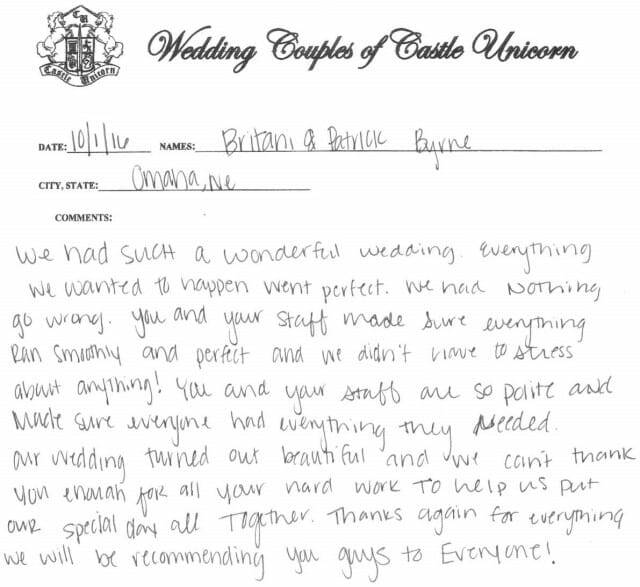 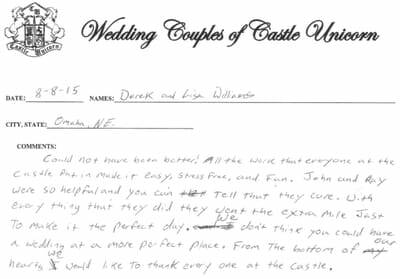 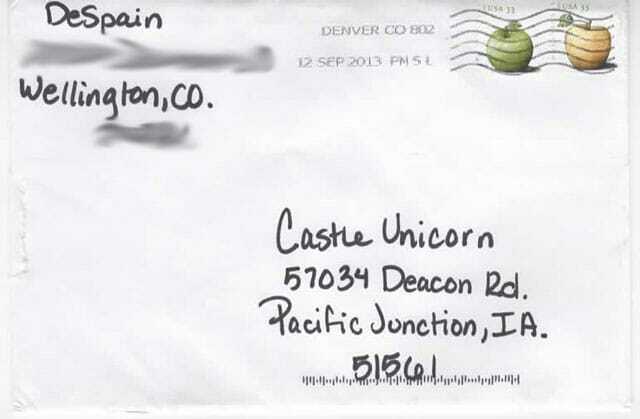 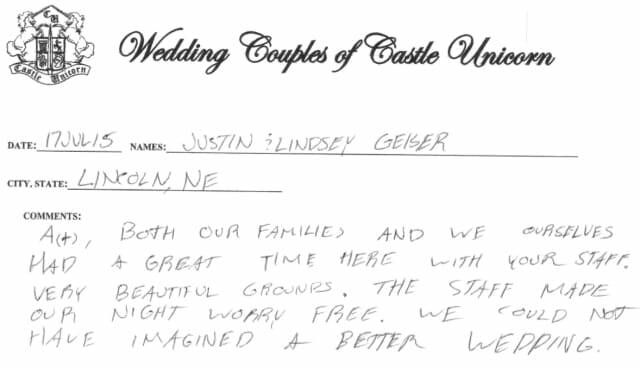 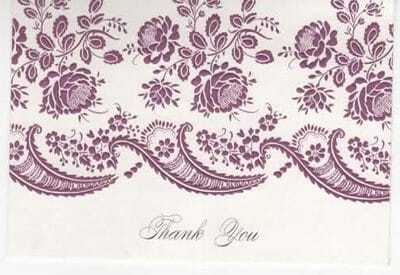 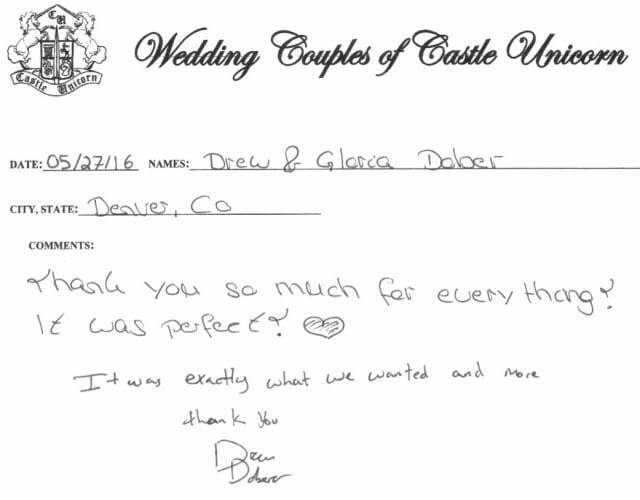 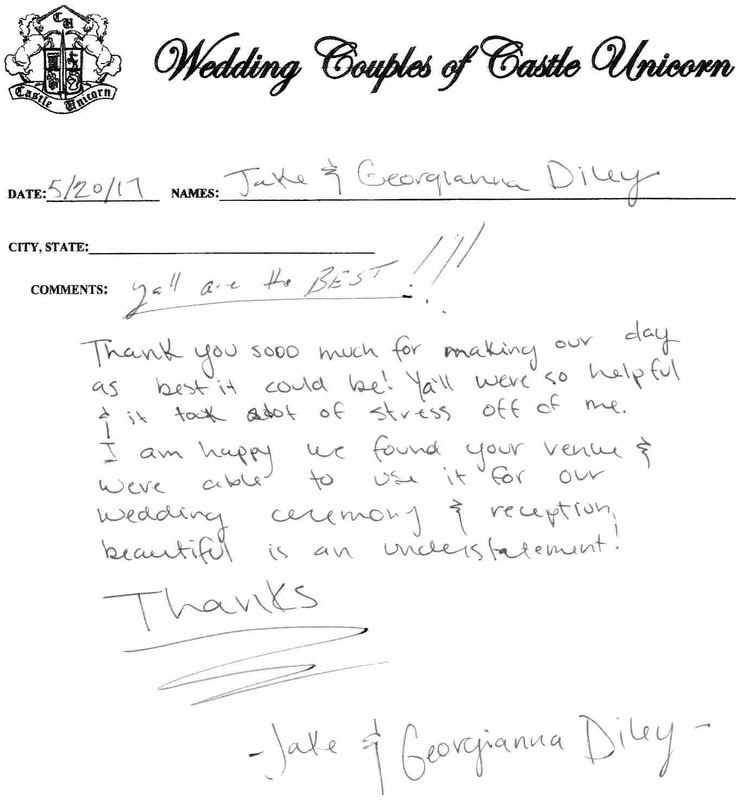 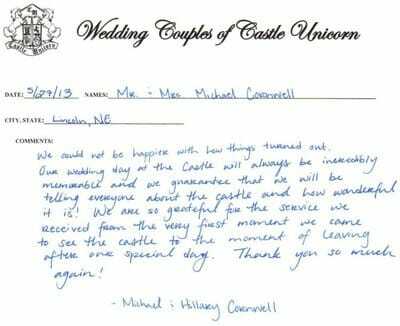 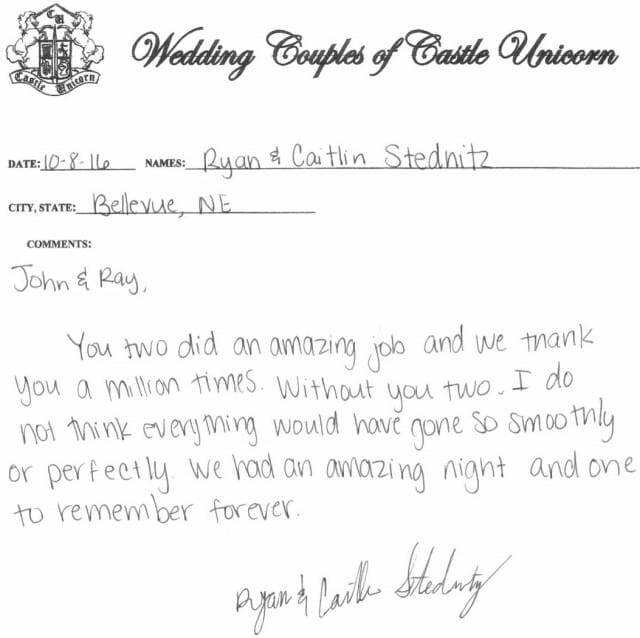 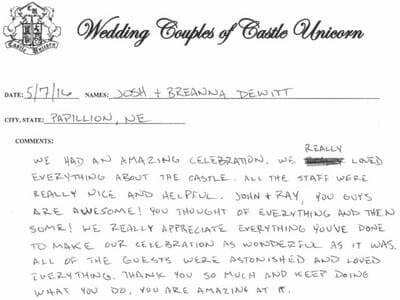 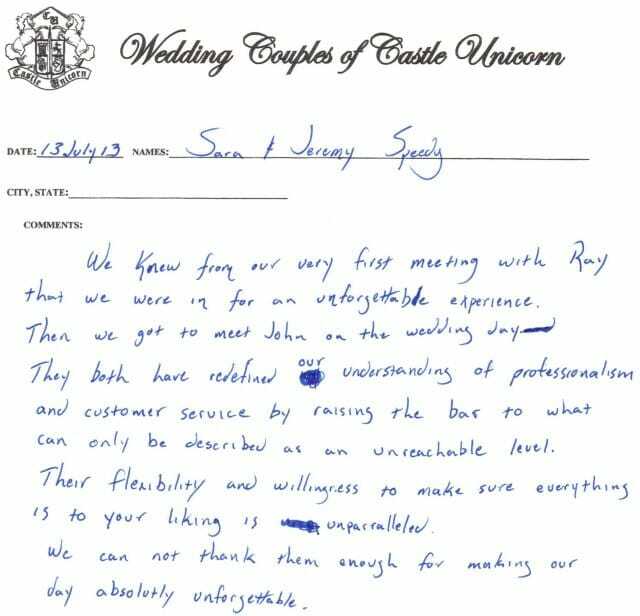 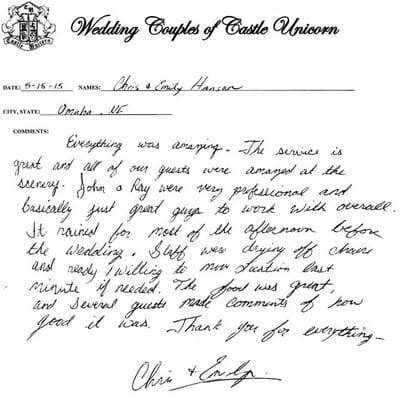 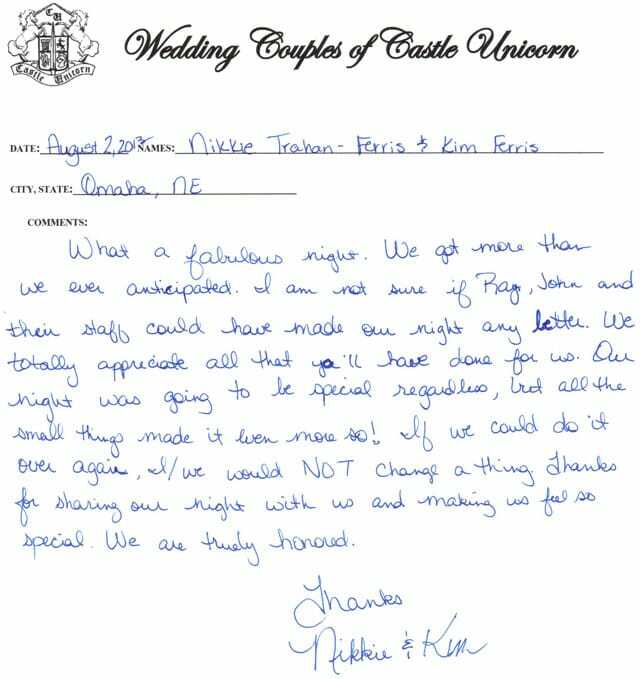 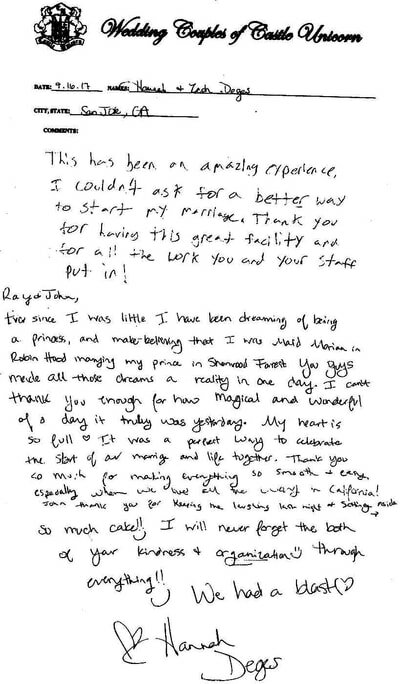 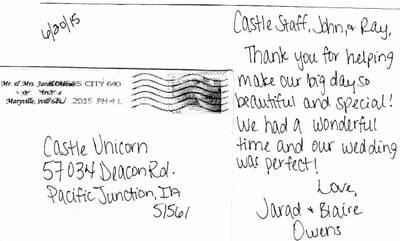 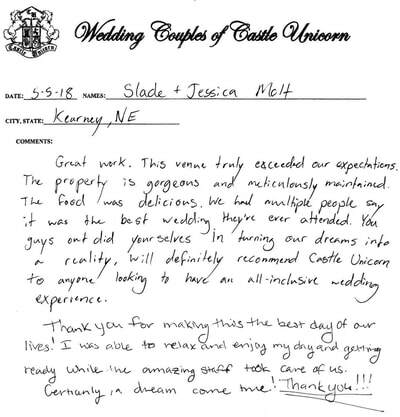 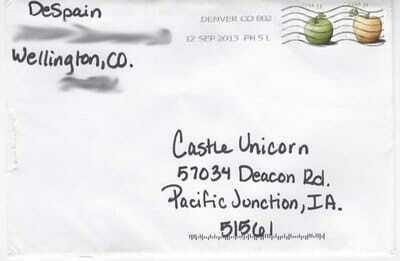 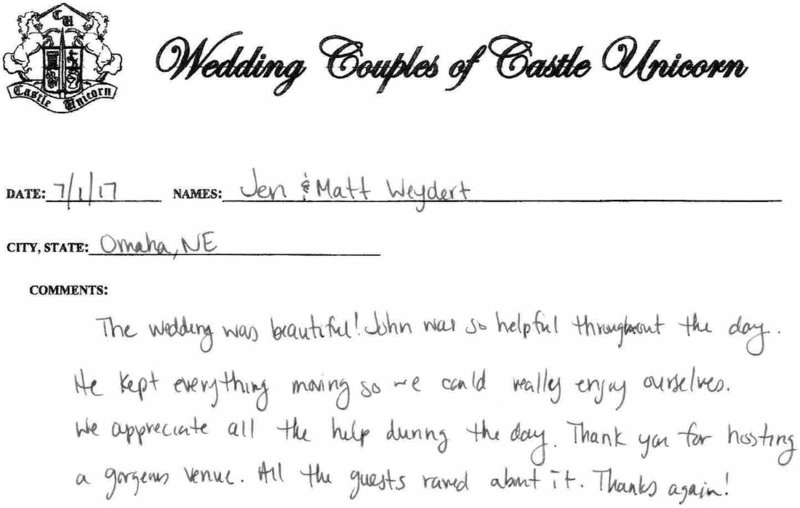 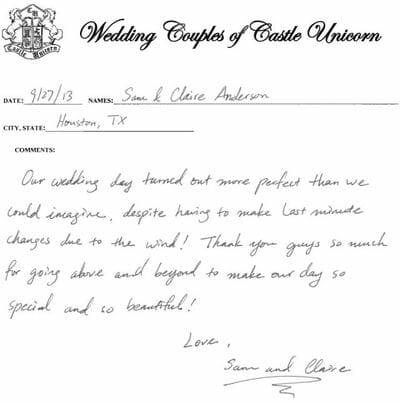 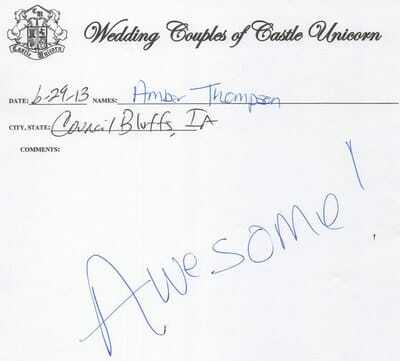 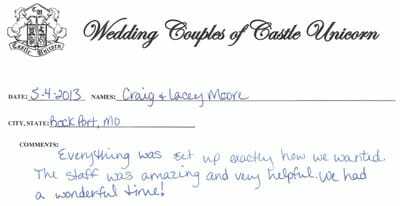 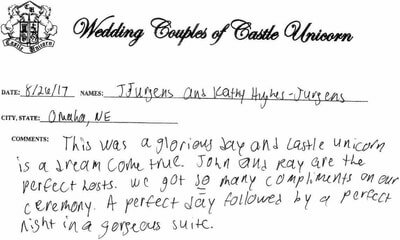 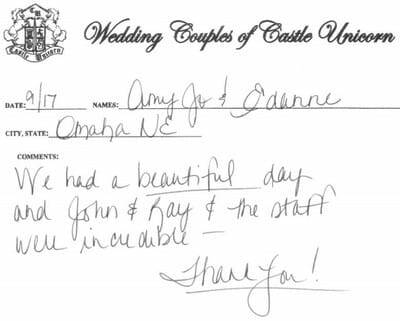 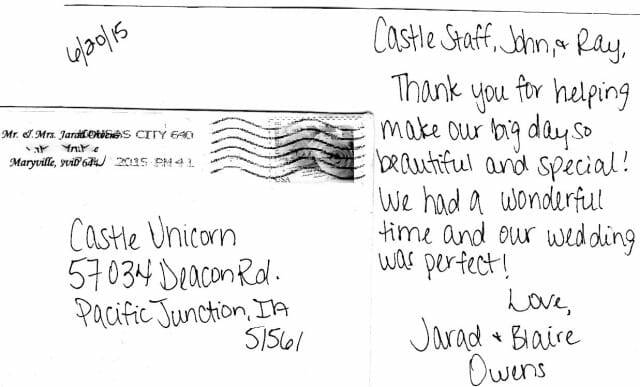 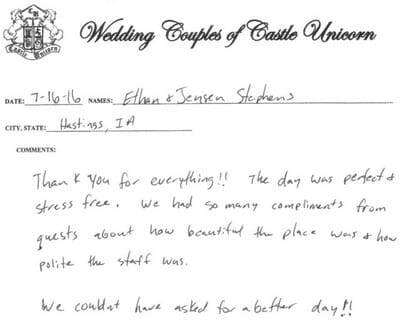 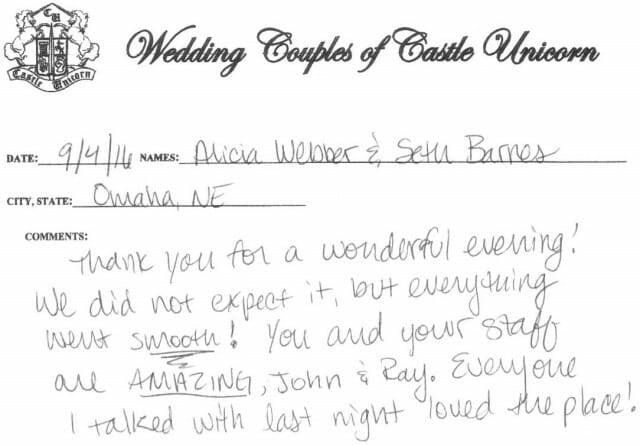 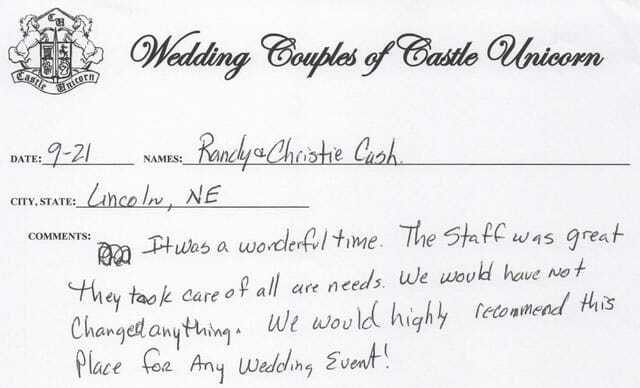 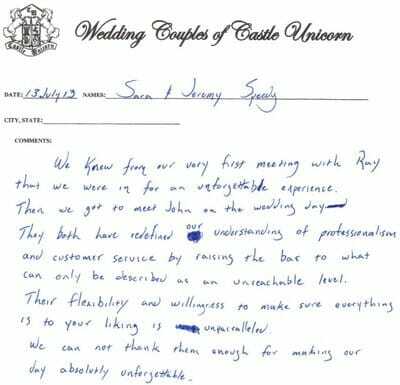 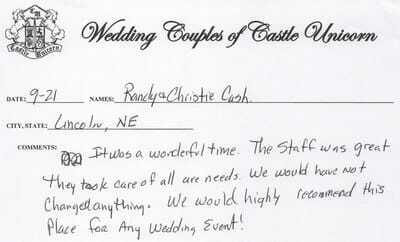 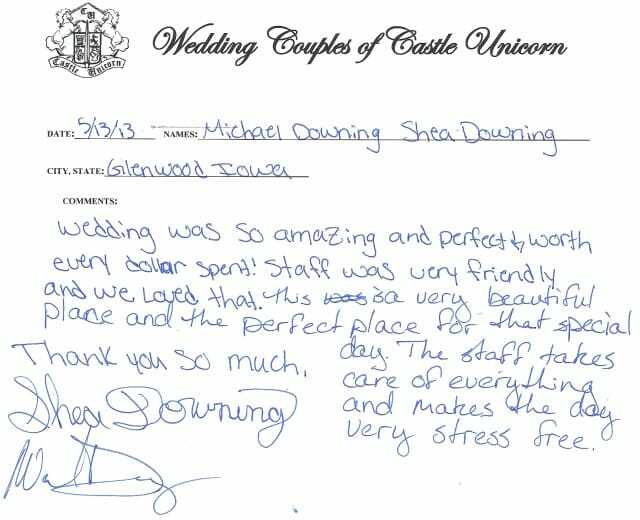 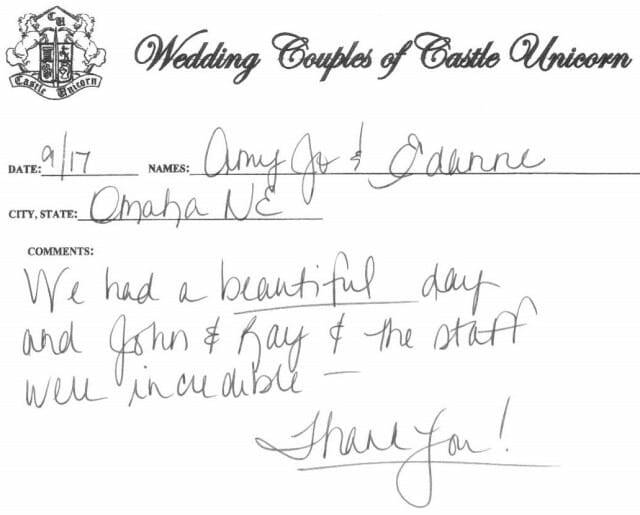 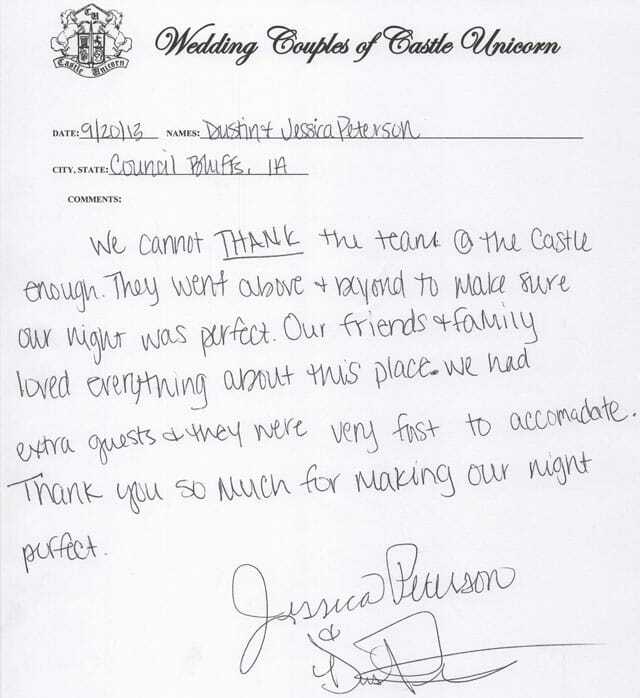 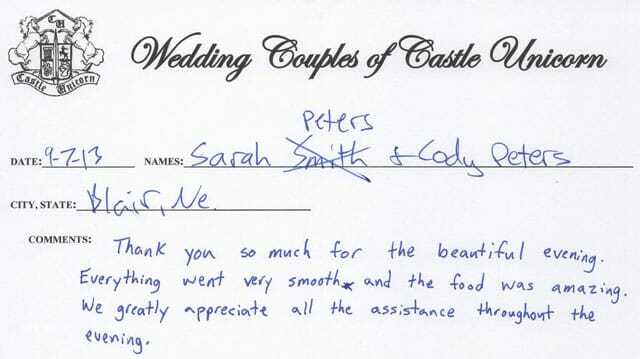 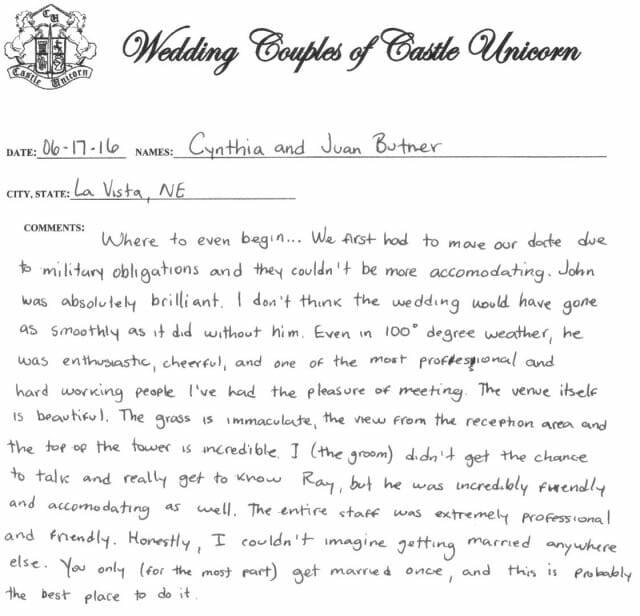 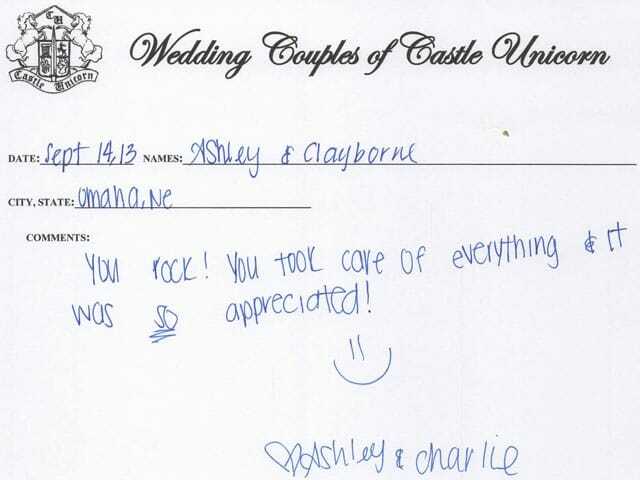 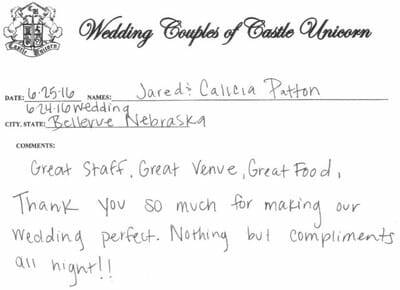 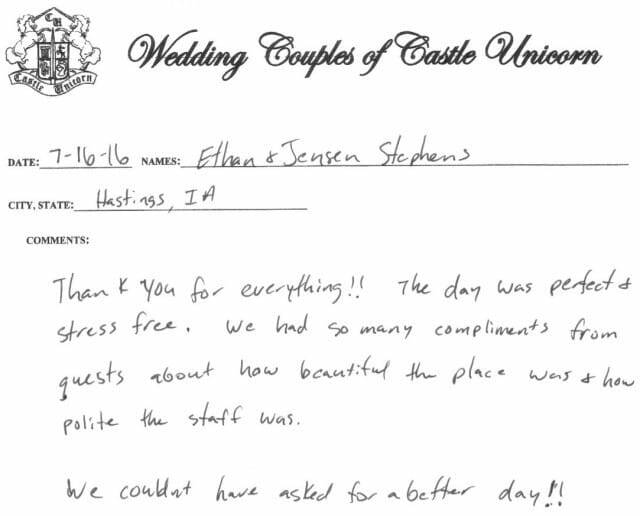 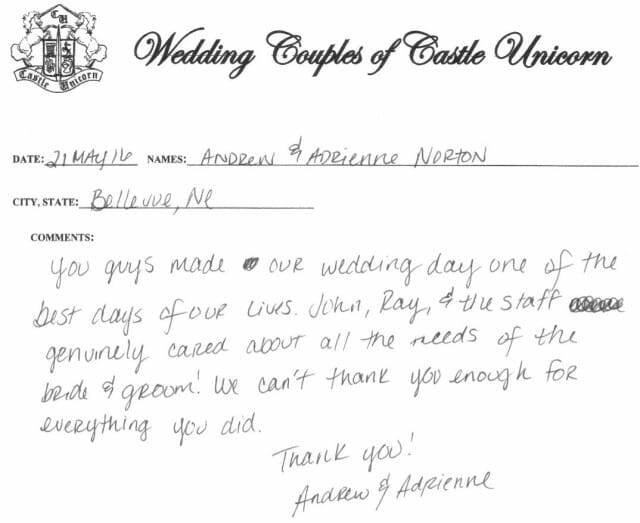 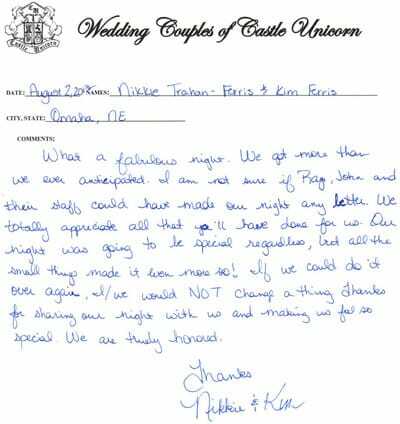 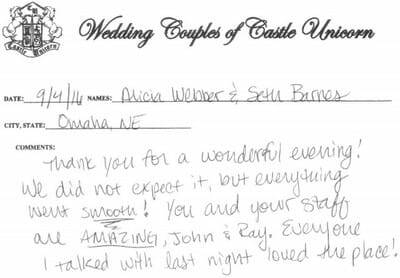 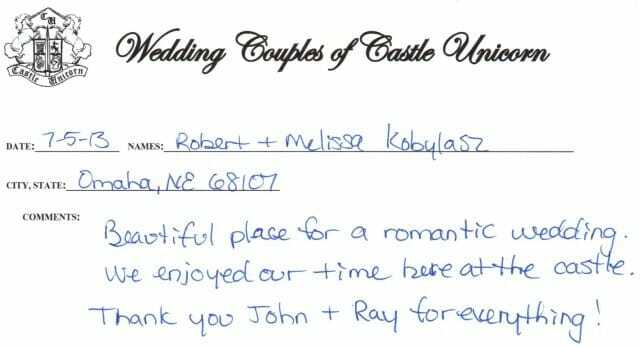 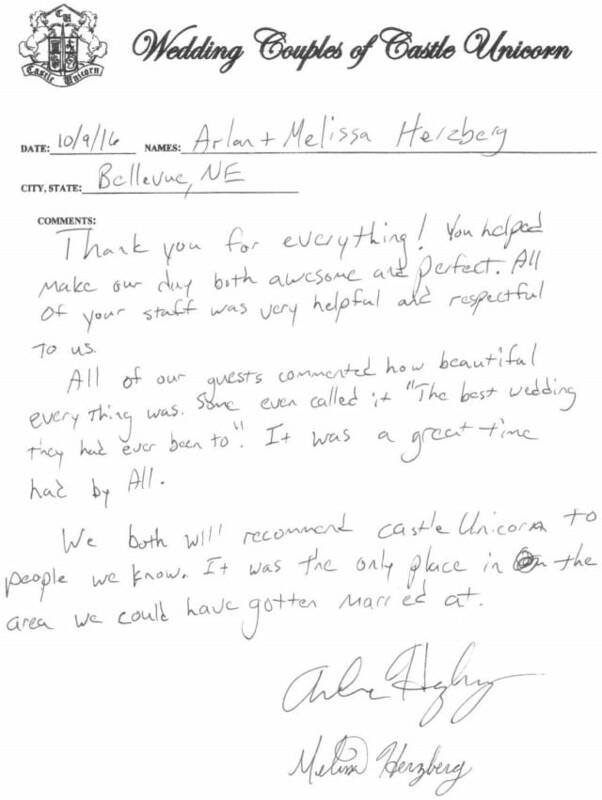 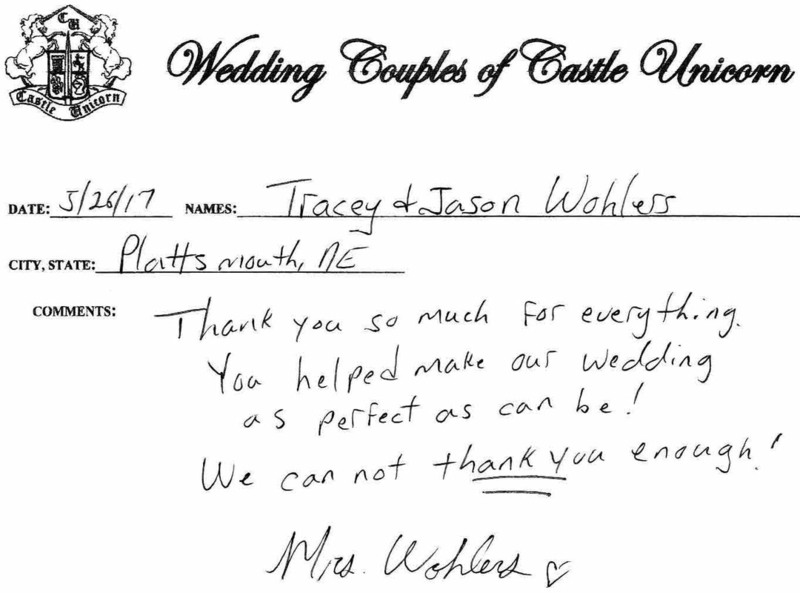 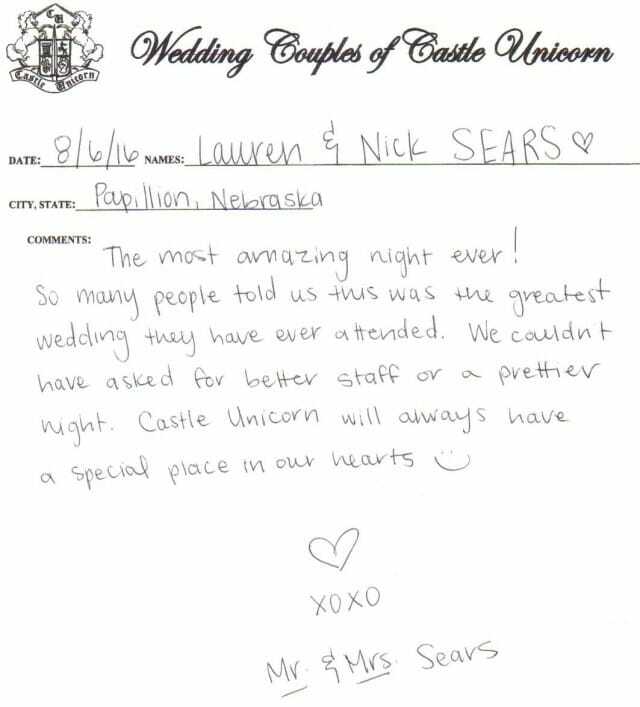 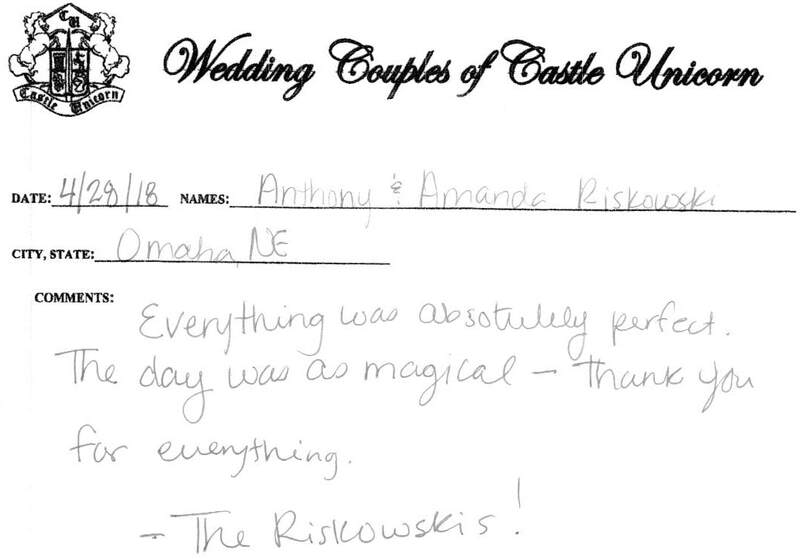 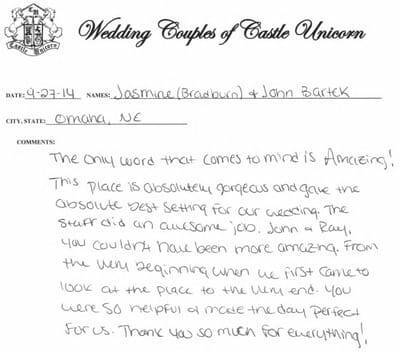 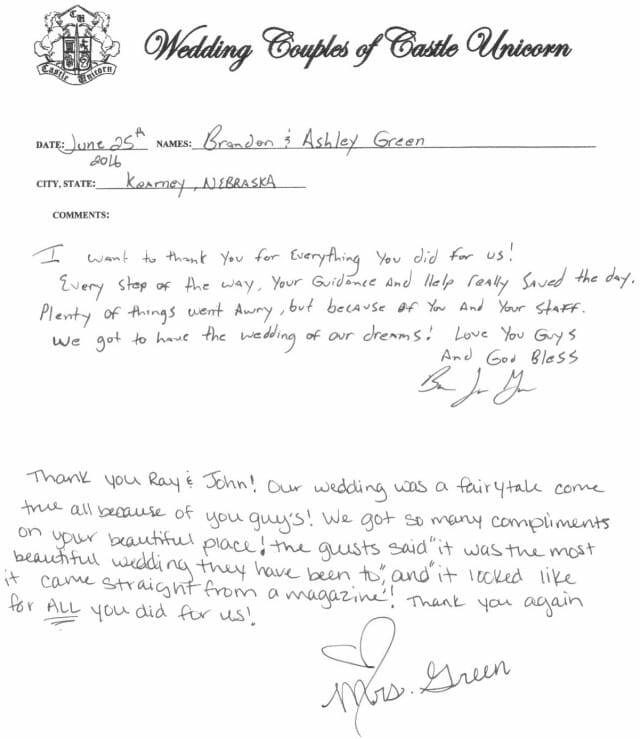 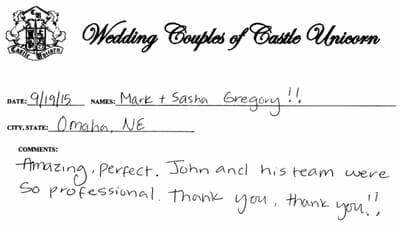 Who better to tell you about Castle Unicorn than happy brides and grooms who’ve celebrated with us? 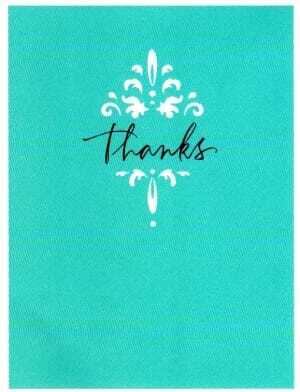 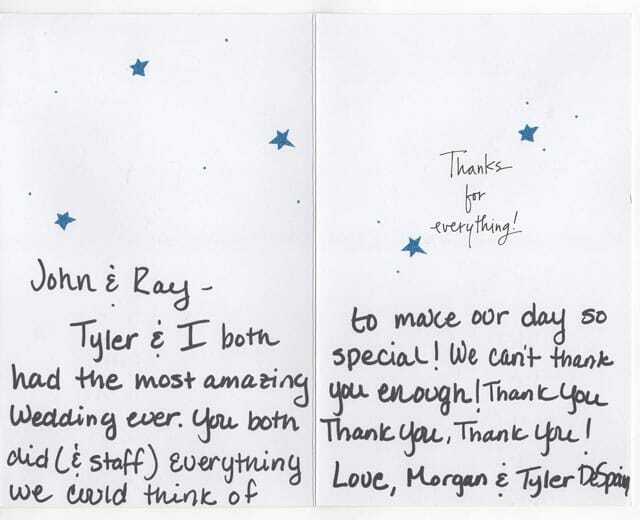 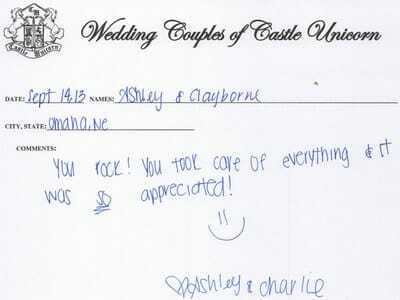 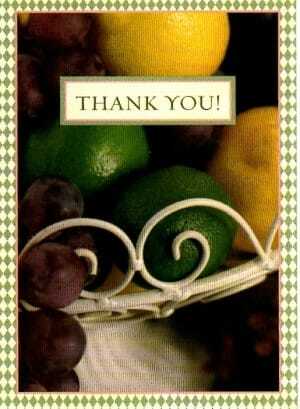 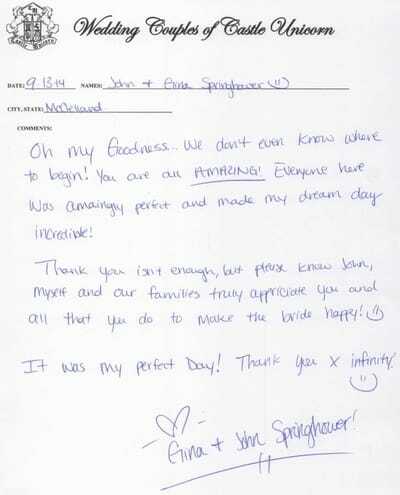 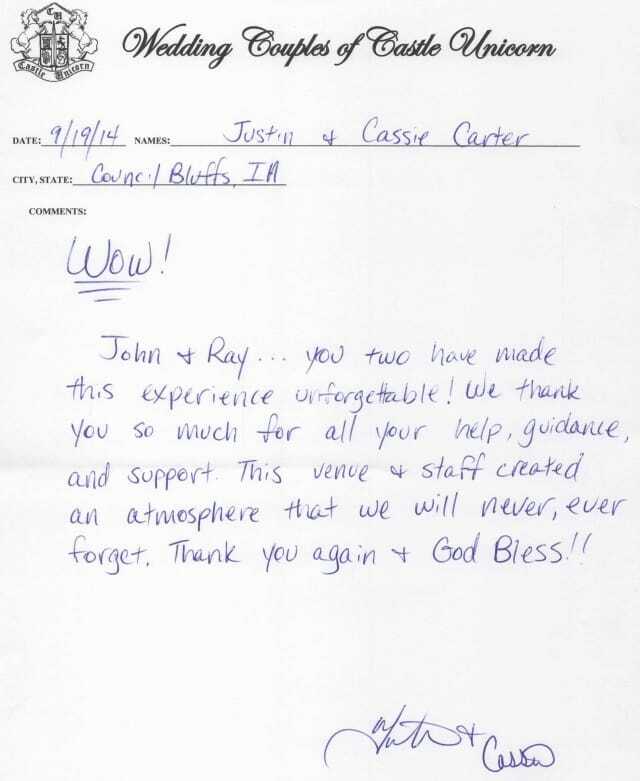 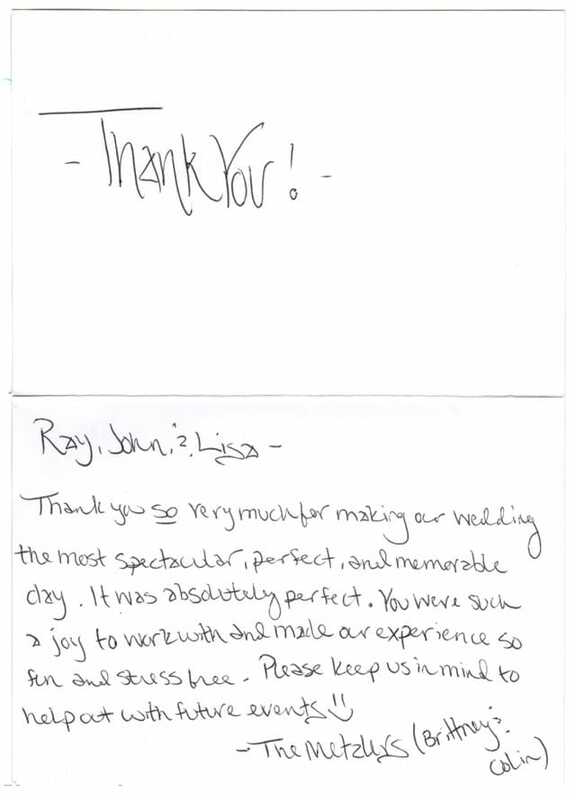 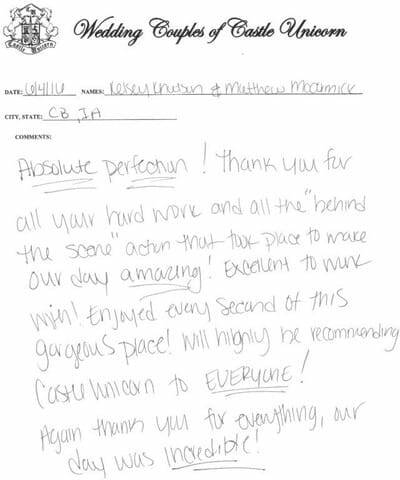 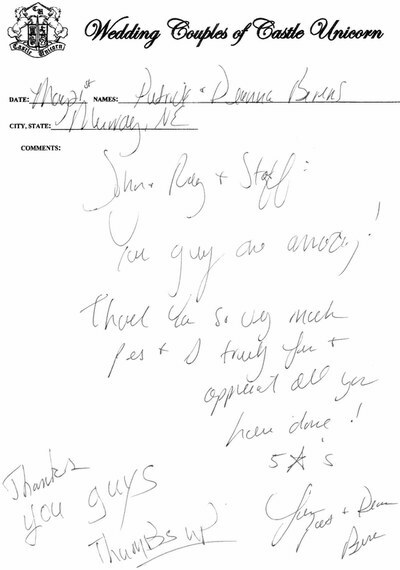 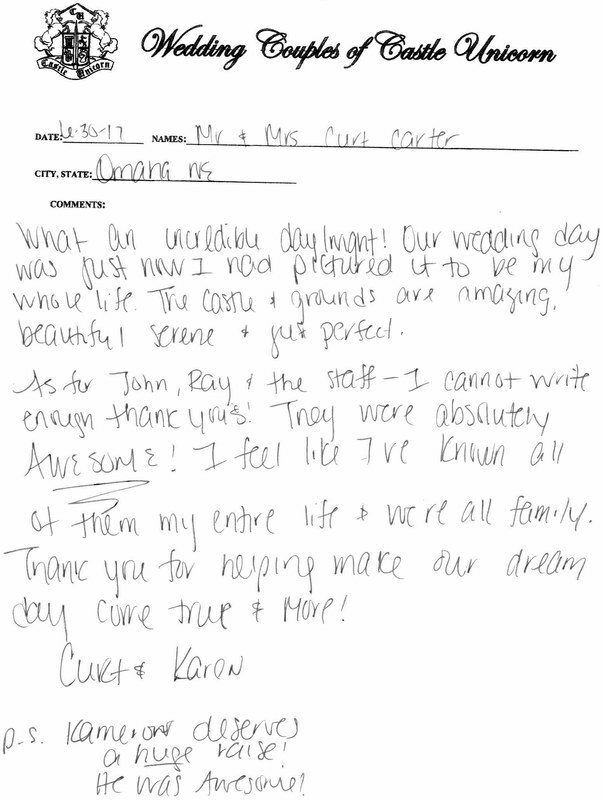 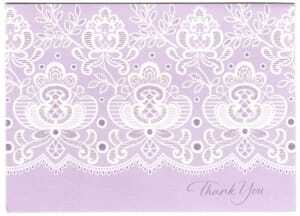 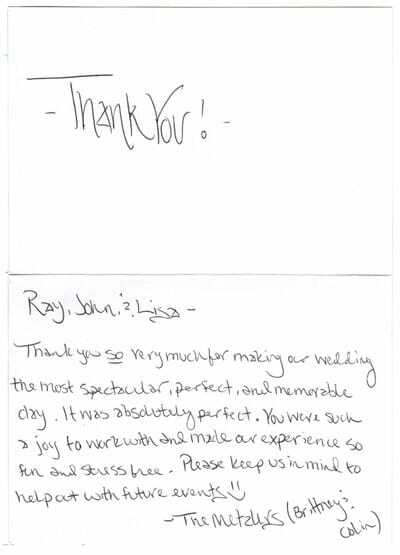 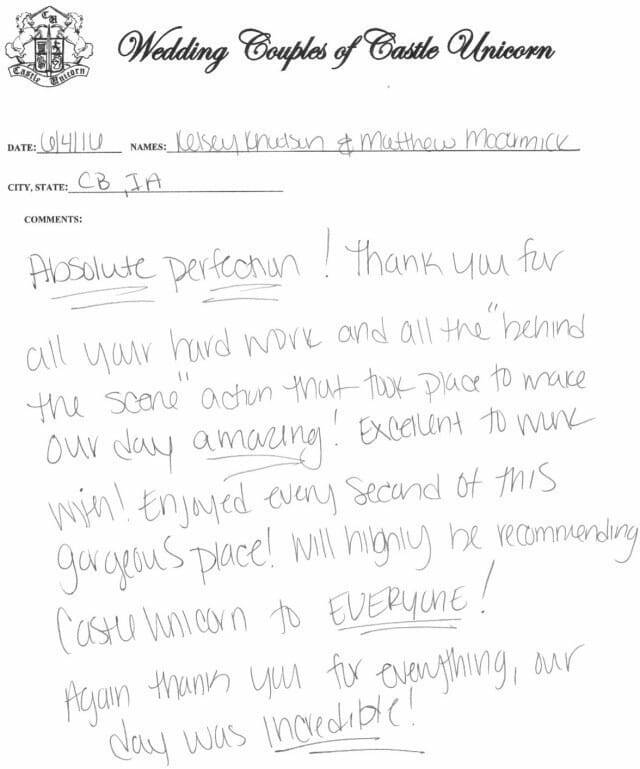 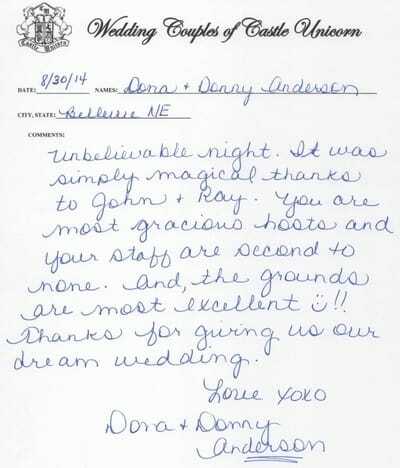 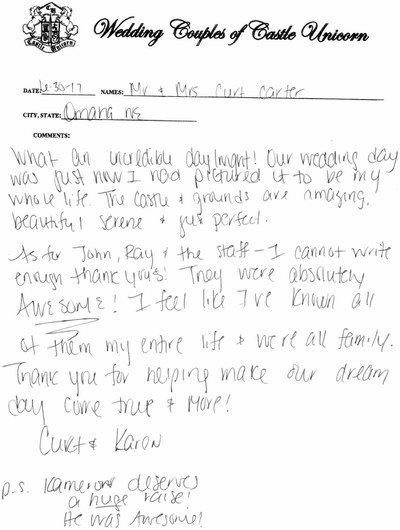 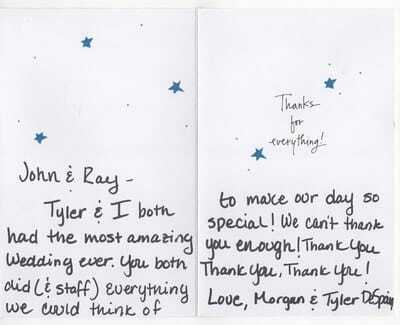 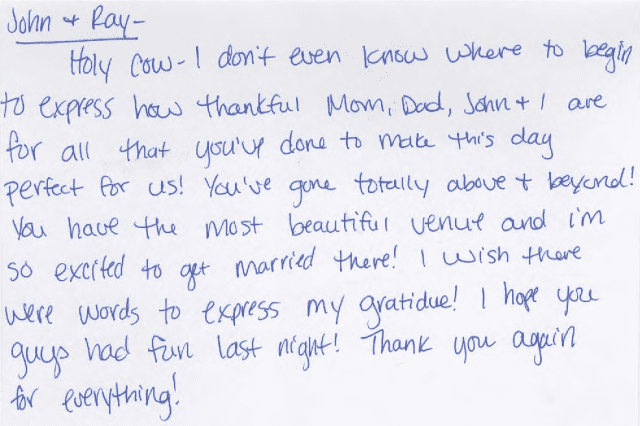 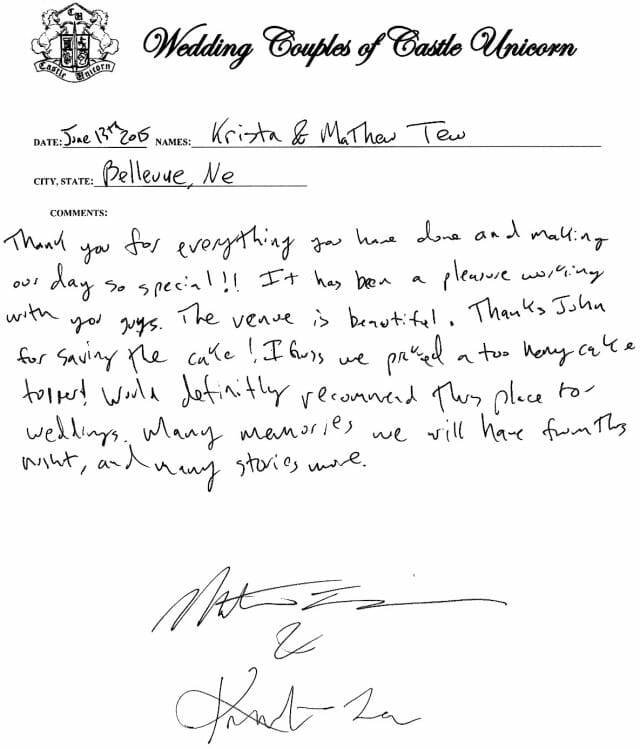 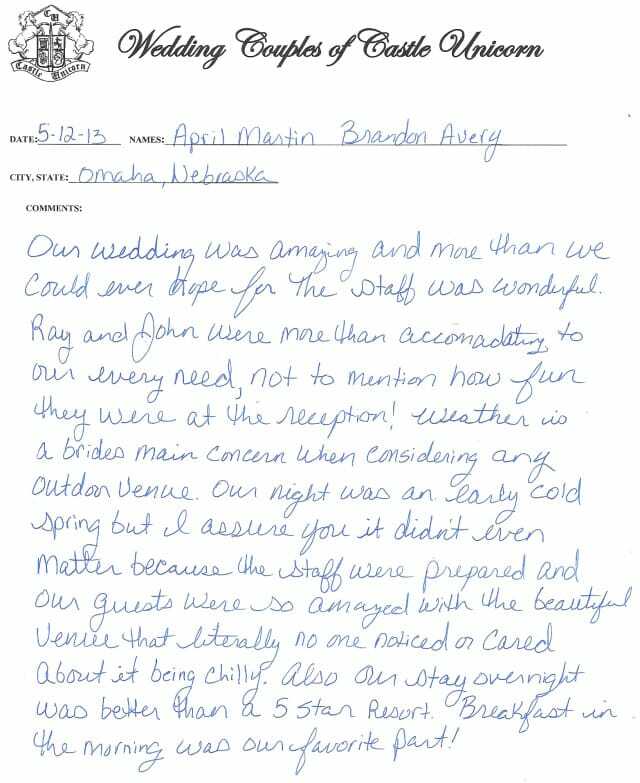 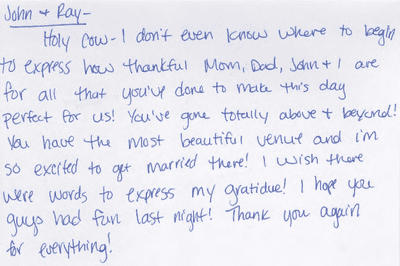 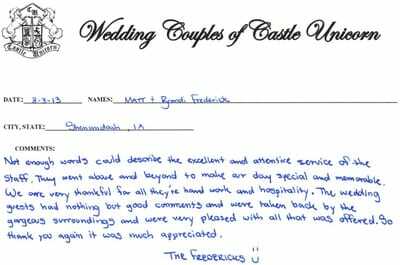 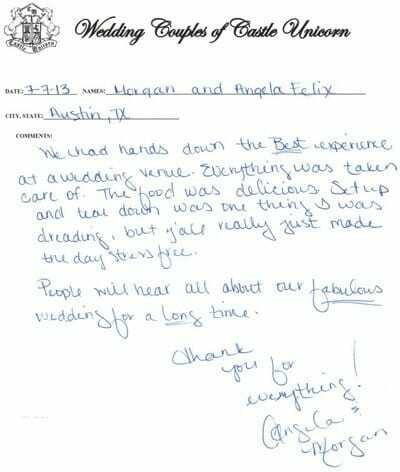 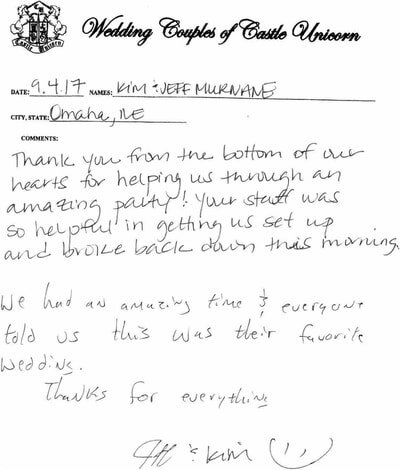 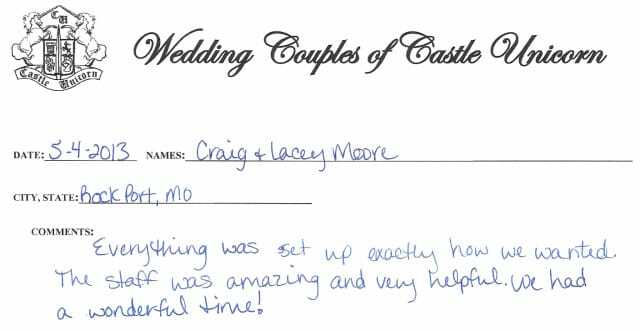 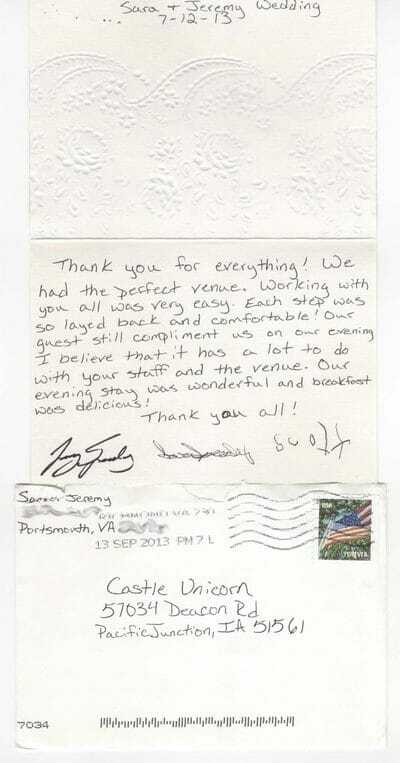 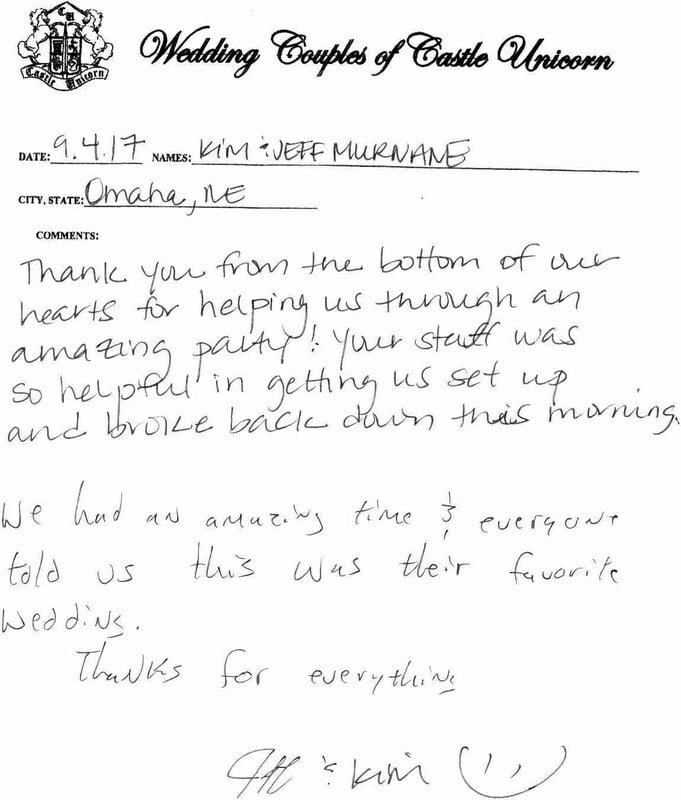 Our satisfied couples make us so happy and keep motivating us to improve. 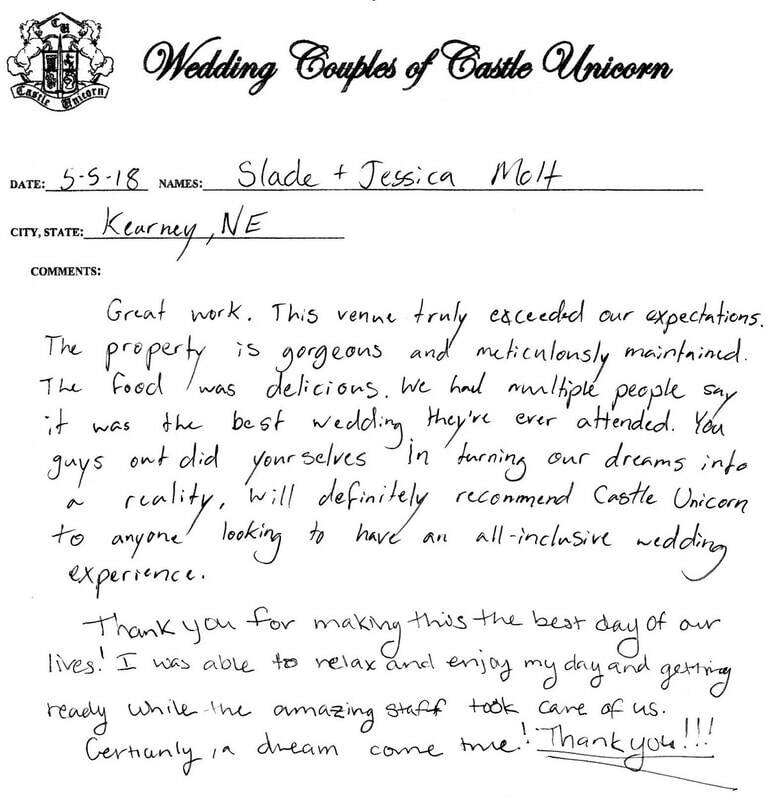 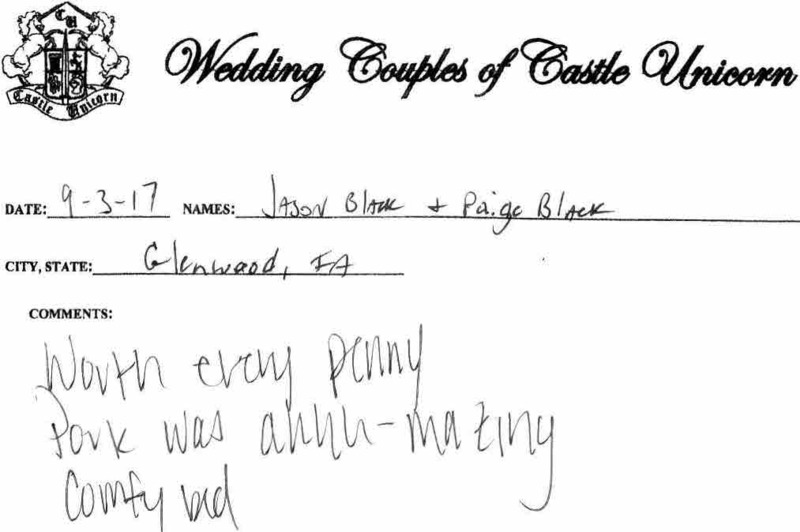 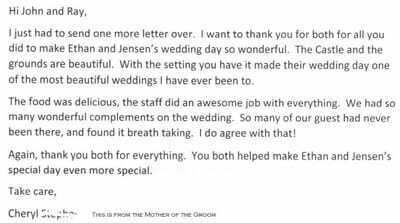 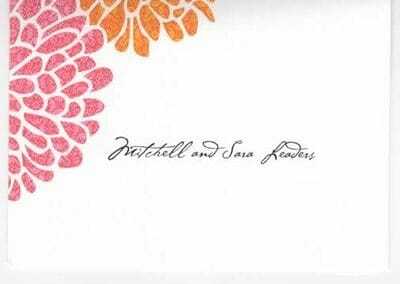 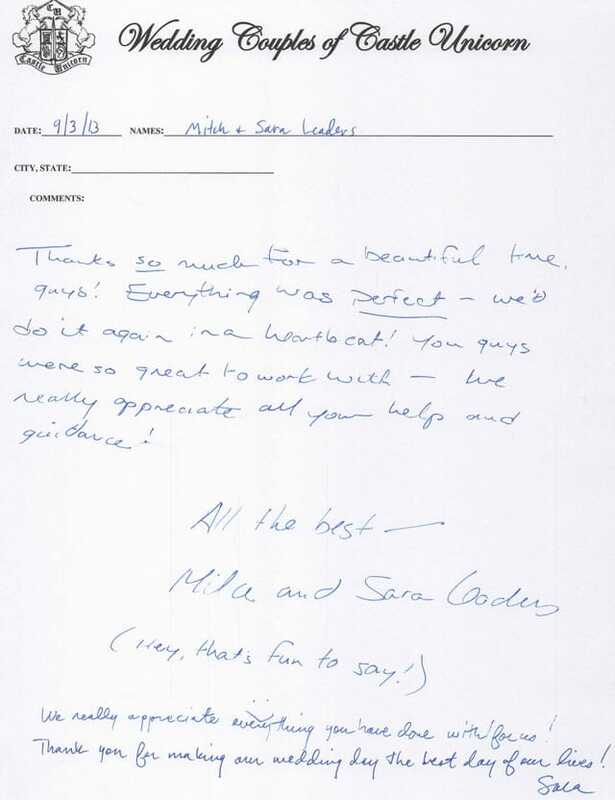 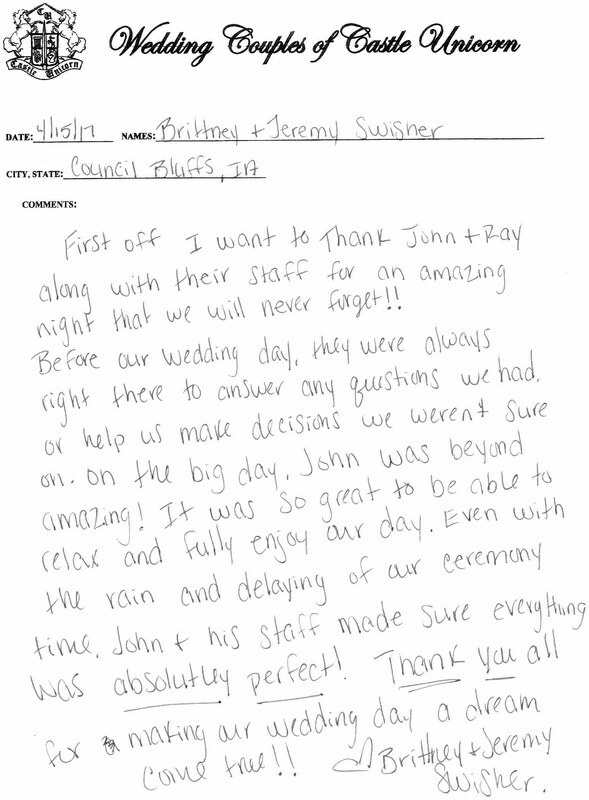 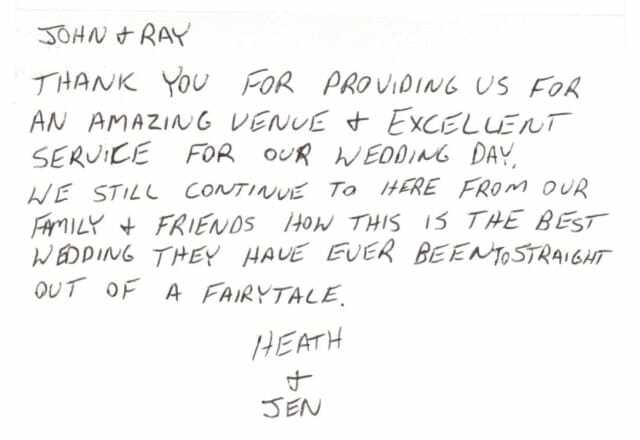 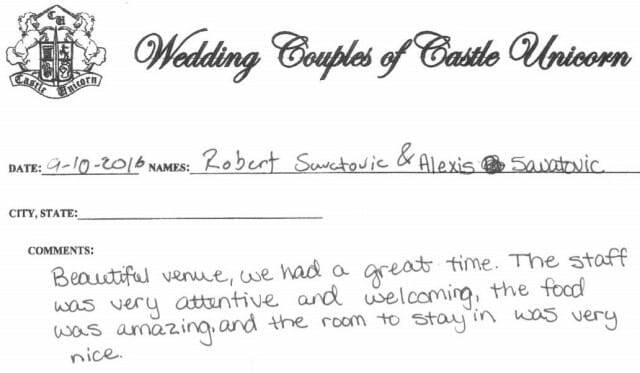 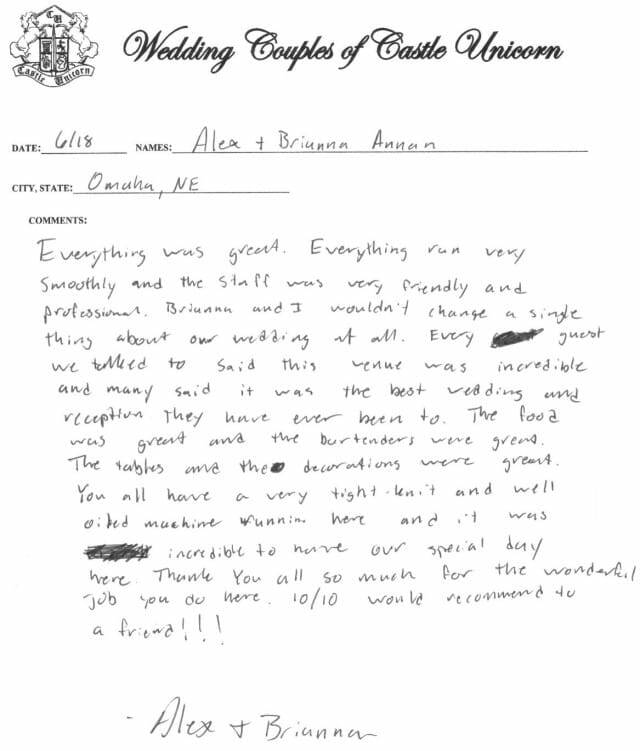 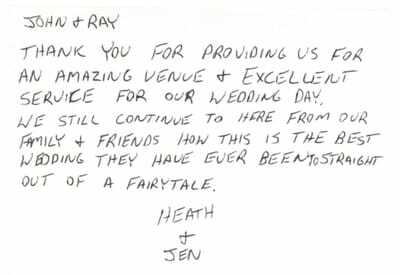 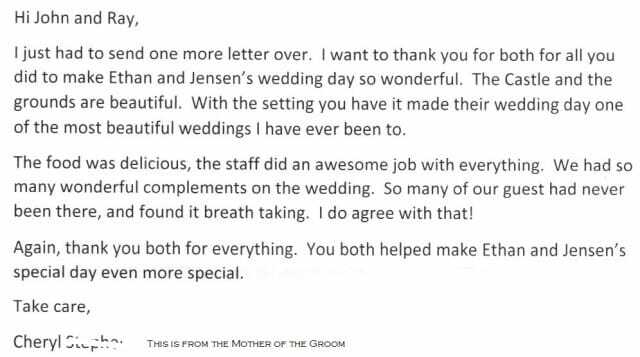 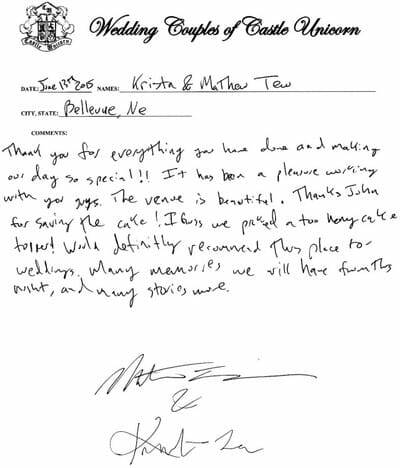 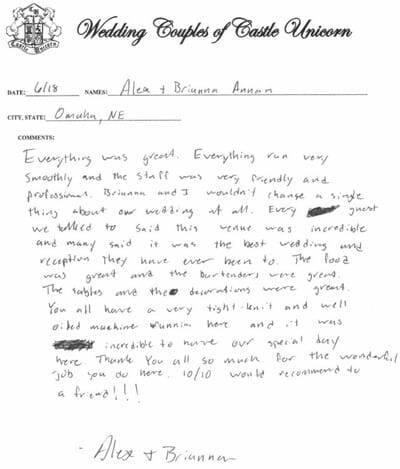 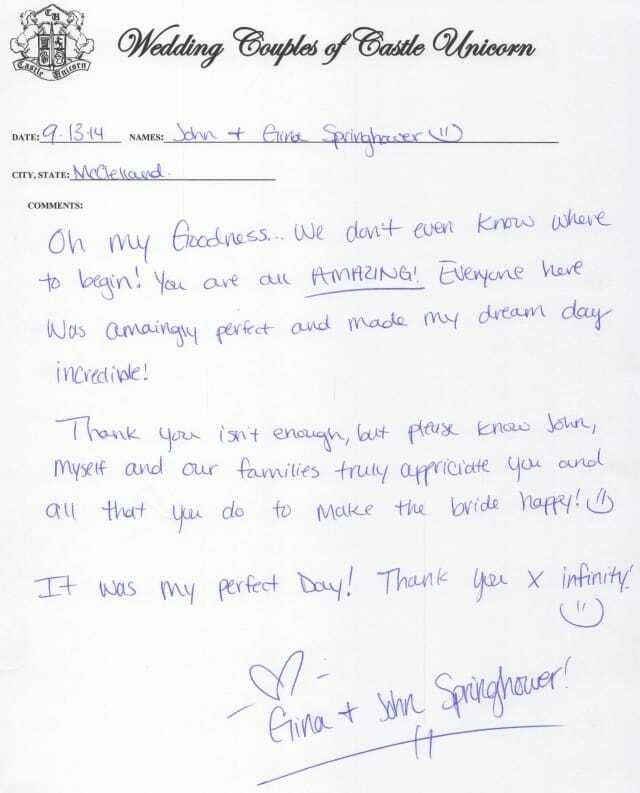 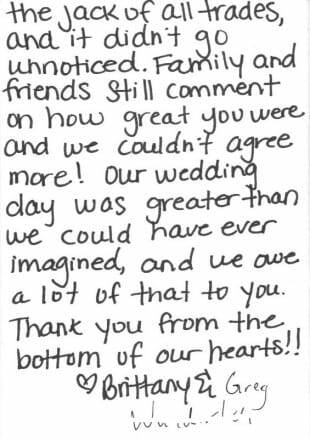 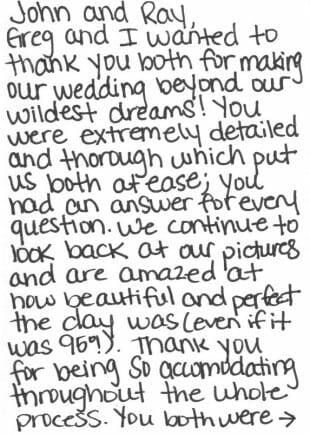 Most of our new couples come to us from word-of-mouth recommendations, so have a look at some of the wonderful things our happy couples had to say about us below. 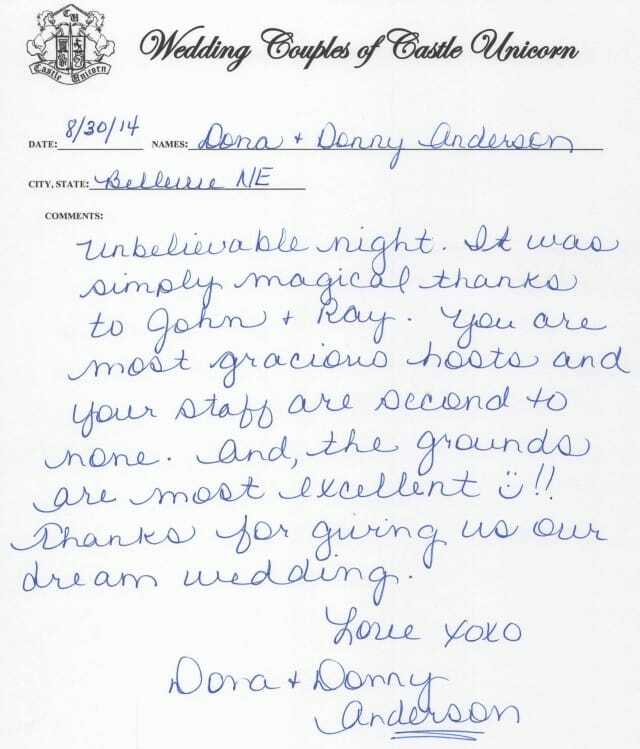 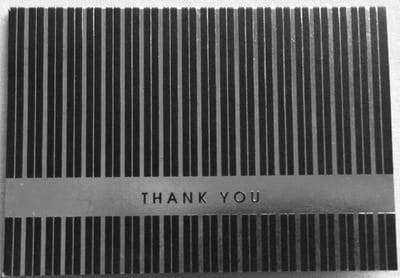 We hope to have you celebrating with us soon. 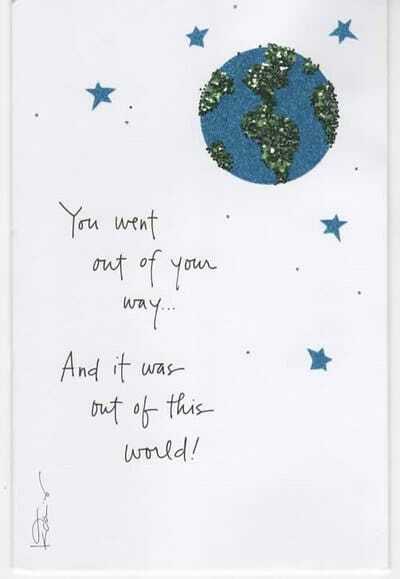 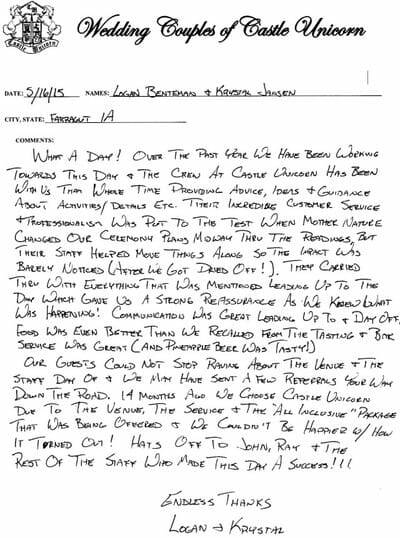 Click On Image To Make It Bigger. 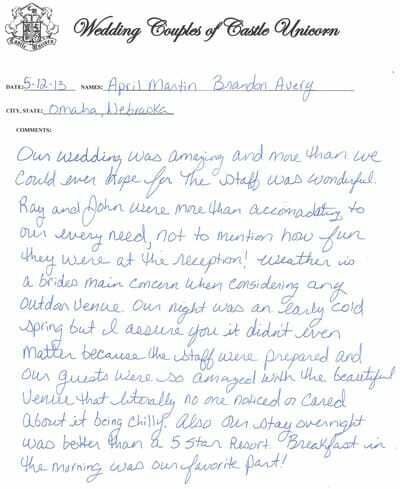 Reviews In Random Order But Newest At Bottom Of Page.